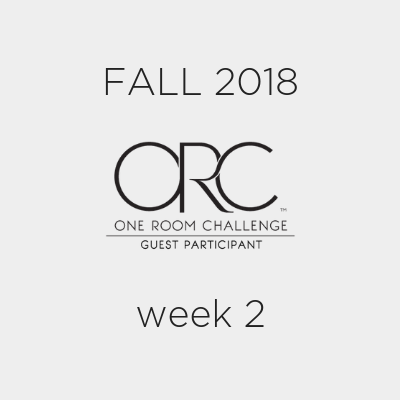 The second week is already here and for me as well as, I believe, for all other ORC participants the time is just flying. If you are new here, thanks so much for checking out my Studio Office Space Design On a Budget project. 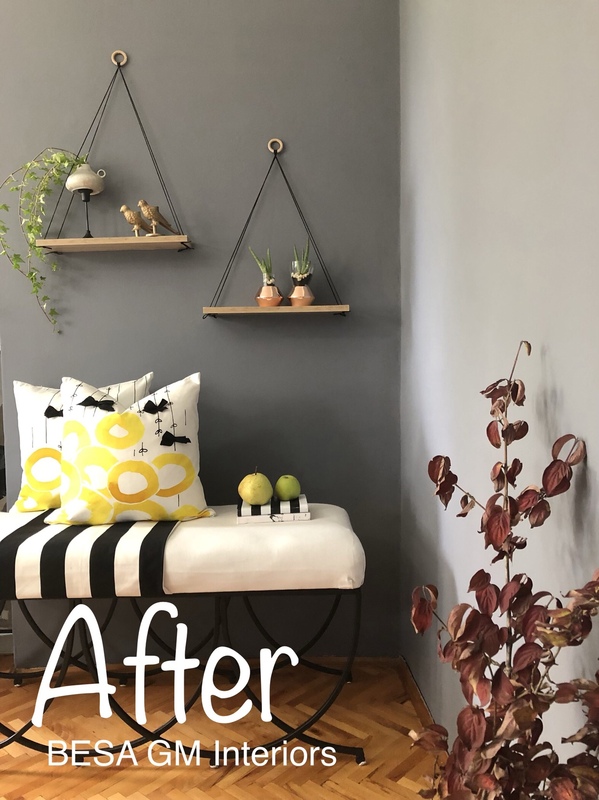 You can check out my first post related to this project if you’d like to see or get reminded what I started with when I entered the One Room Challenge event. As far as myself is concerned I can say that, this week was an intense working week around here and there were a lot of major tasks that I had to undertake on the first week of this challenge. 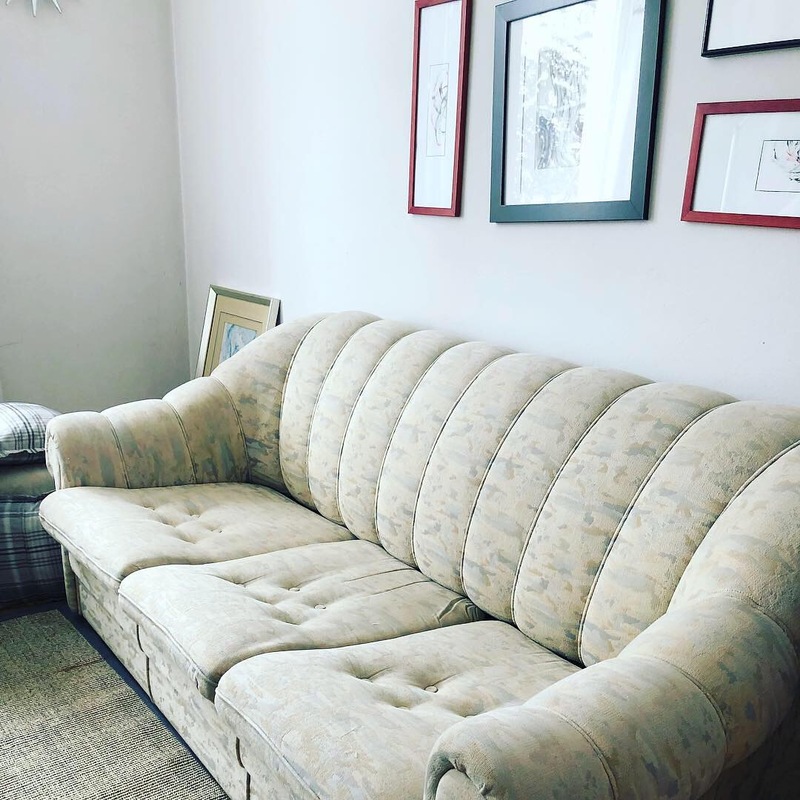 First I cleared up the room from all the stuff that was in it, took off the sofa slipcovers and arranged that the old sofa and loveseat are taken to the junk yard. Arranging these tasks, due to some complications, took me almost two days. After the room was freed from the bulky stuff, I started with prepping the walls so I could apply the paint on the walls and the ceiling. I did the filling of the cracks and nail holes on the walls and applied the primer. I also managed to start with the first coat of paint. 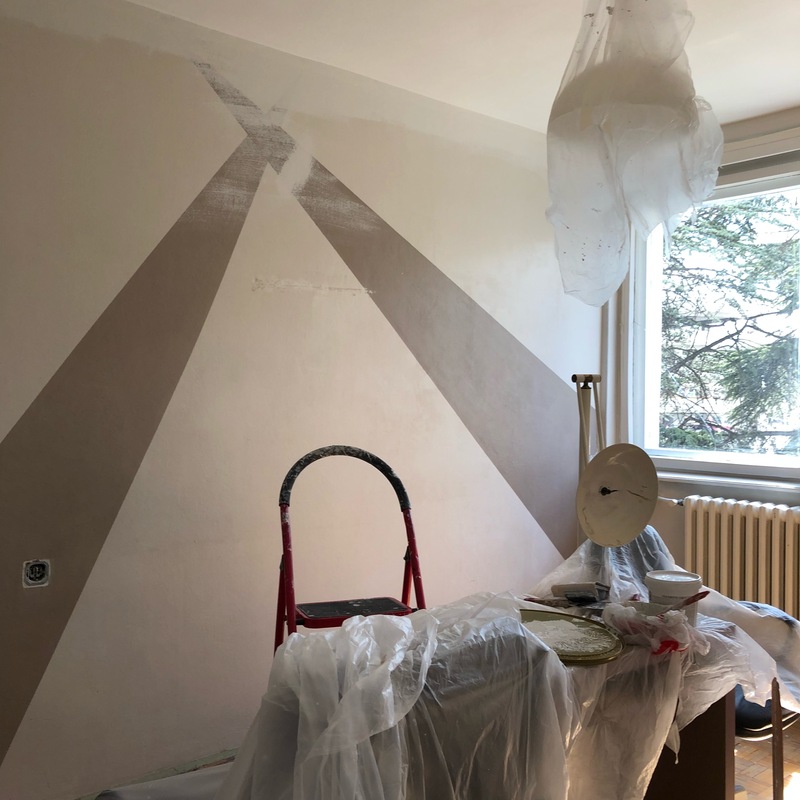 After I am done with the paint, there comes the hard job and I may say an intimidating task of stencilling the walls with a sharpie! 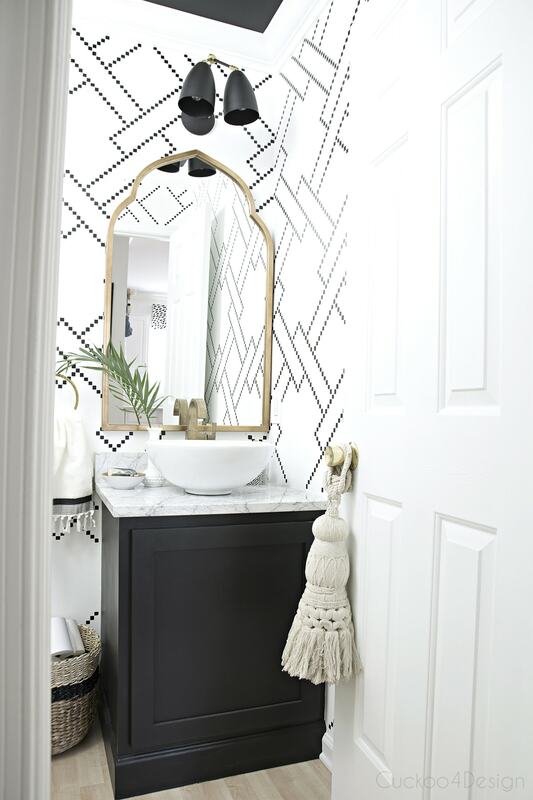 I was inspired by the talented Julia from cuckoo4design who created the most chic little square stencil which she used on her powder room walls. 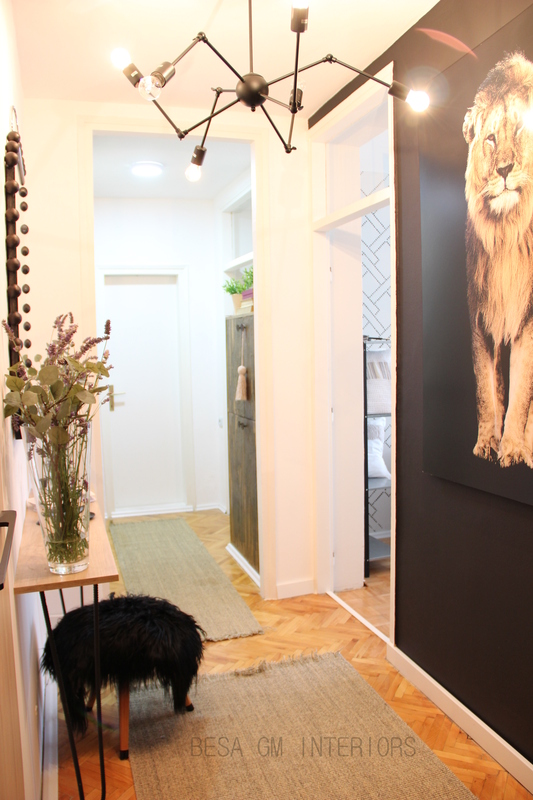 She turned a small powder room into a such lovely space in her home. Thank you Julia for creating this stencil, I am in love with the design. 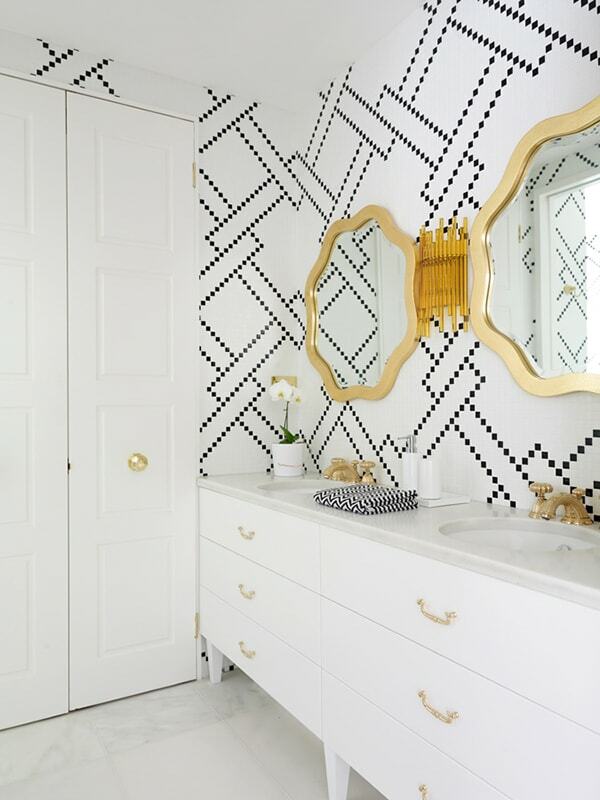 To create this stencil she was inspired by this bathroom designed by Greg Natale. Everyone may agree that this is absolutely a stunner bath! Unfortunately I couldn’t order the stencil, so I had to make my own. 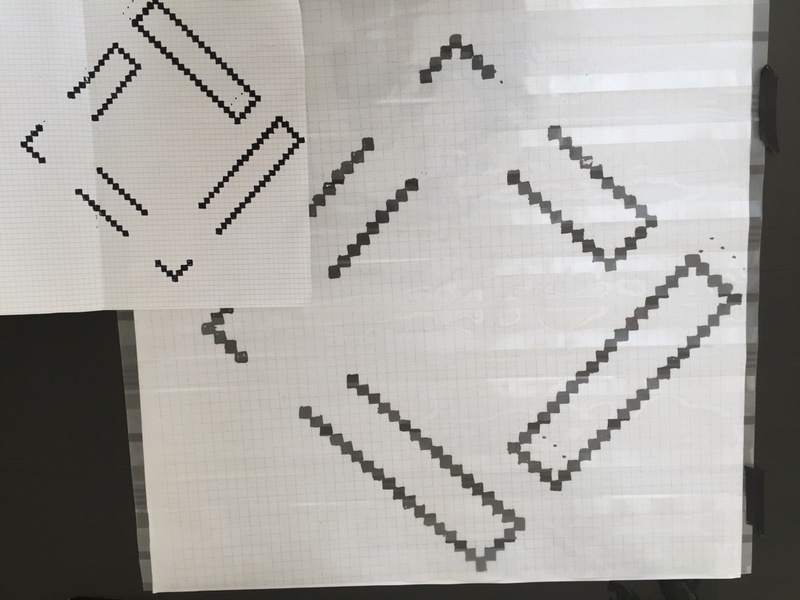 I figured out how this stencil works for the repeat, and then I marked the small squares in a double A4 sheet. I enlarged the double A4 sheet twice using a photocopying machine, and laid the sheets with the design underneath the clear vinyl sheet. 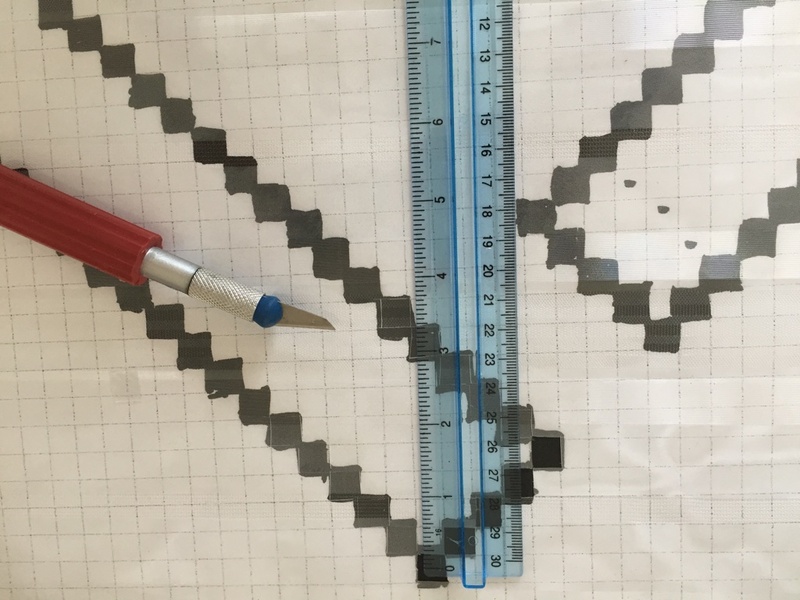 Using the exacto knife, and following the design underneath the vinyl sheet, I started cutting the small squares. I ended up with not so perfect stencil, but I am still determined to go ahead. I ask everyone to keep the finger crossed so I will not mees up the accent walls with this DIY stencil. So this is all I have to share for this week. I am back to painting the room and hopefully will be ready by Saturday when I expect the floor refinishing guy to come and do the floors which are begging for refinish. 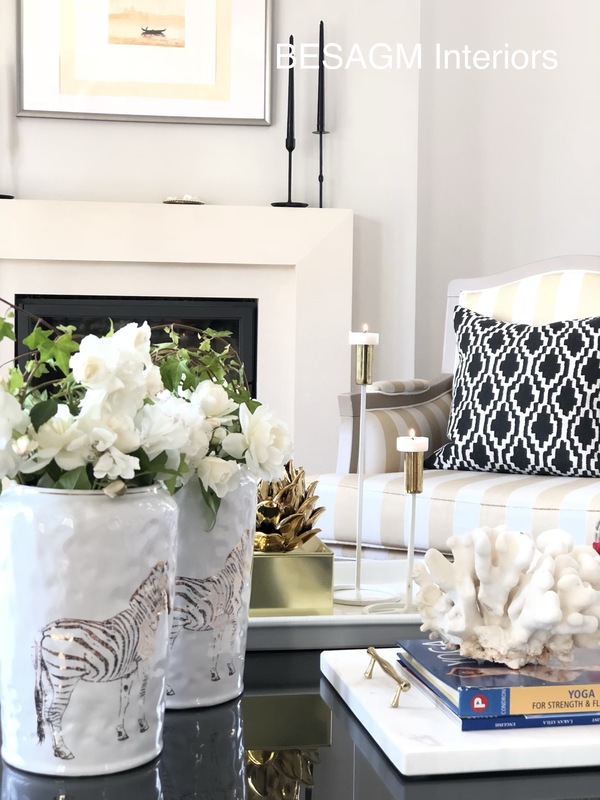 Be sure to check out the One Room Challenge Blog to see all the great participants as well as featured designers and their amazing home transformations! 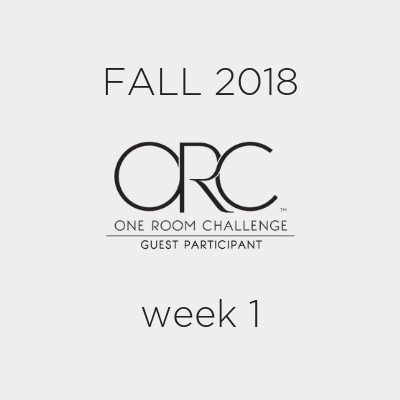 I am so happy that I finally made a commitment to take part as a guest participant in the fall edition 2018 of One Room Challenge event. 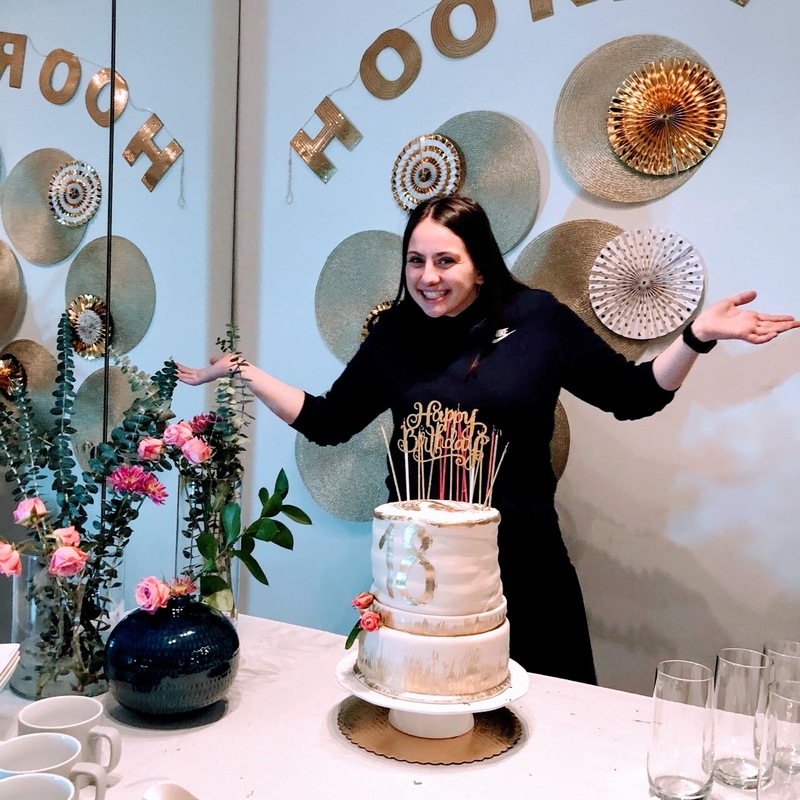 For those out there who wonder what the One Room Challenge (or the ORC) is, it is an interior design/decor event that happens twice a year and is put together by the incredible Linda from Call It Home blog. 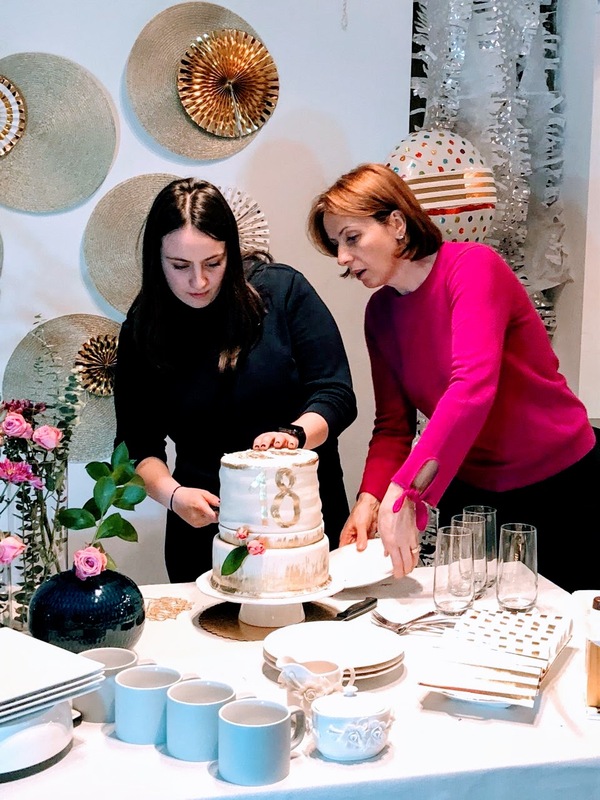 The event starts with a group of talented designers selected to transform a room in short six weeks. The rest of us get to be guest participants that start a day later. This is the second time that I am taking part as a guest participant and I am even more nervous than the first time. The first year I took part was for the spring ORC edition 2016, and I did a makeover of the room shown in these pictures. For this year I am redoing again this room as shown, and which will be used as my Interior Studio Office space. Since my business is in baby steps at present, I have allocated a minimal budget to complete this space in 6 weeks. Therefore, there will be a lot of DIY’s involved and most of the job will be done by myself, so I am just crossing my fingers that everything will go smooth, and I will be able to deliver something worth of showing in six weeks time. 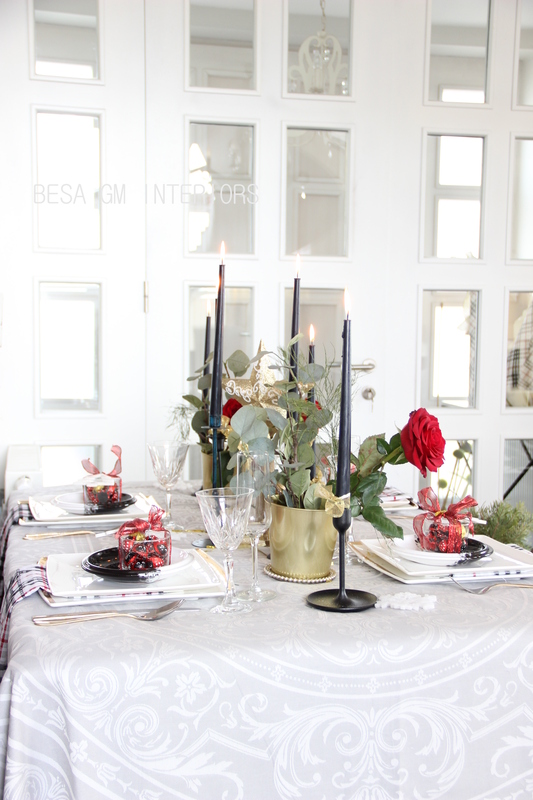 So my friends, lets the fun begin, and I happily invite you to follow my journey through these coming weeks as I will try to make BESA GM’s Interior Studio space to a cool and chic interior all on a budget, and follow as well the challenges I may face during this journey. Below, a few more photos of the current look of the room wich is about to get a completely new vibe in six weeks. 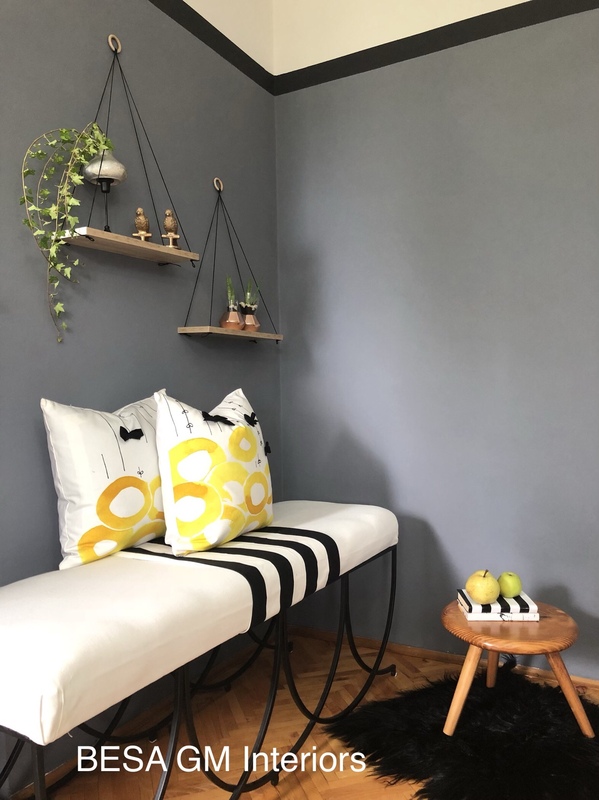 Please take time to check the progress of the work of the featured designers who are taking part in the One Room Challenge as well as other guest participants, where you may get tons of inspiration and learn on the hottest trends in home decor. Thank you for visiting this page, and stay in touch by following this blog. 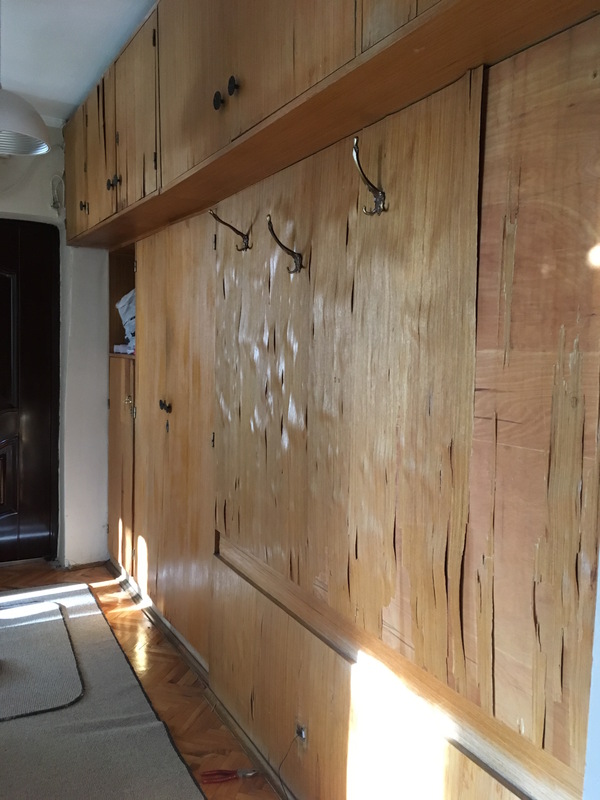 Almost thirty years ago, when my husband and I were renovating and decorating our first condo, we pretty much drained our budget with the first two purchases: kitchen cabinets and living room furniture. In fact, not only we drained our entire budget, but we had to pay for the purchases in instalments for one long year. 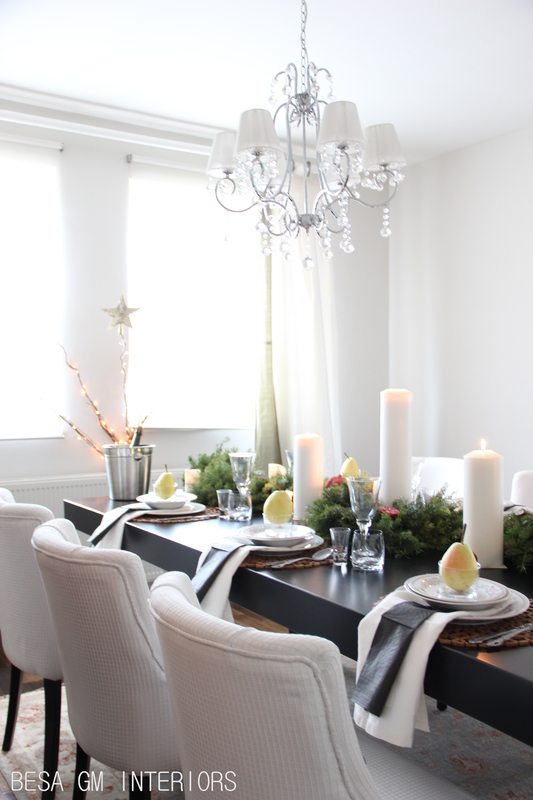 Our budget was drained and our condo looked pretty much empty without any decorative items. 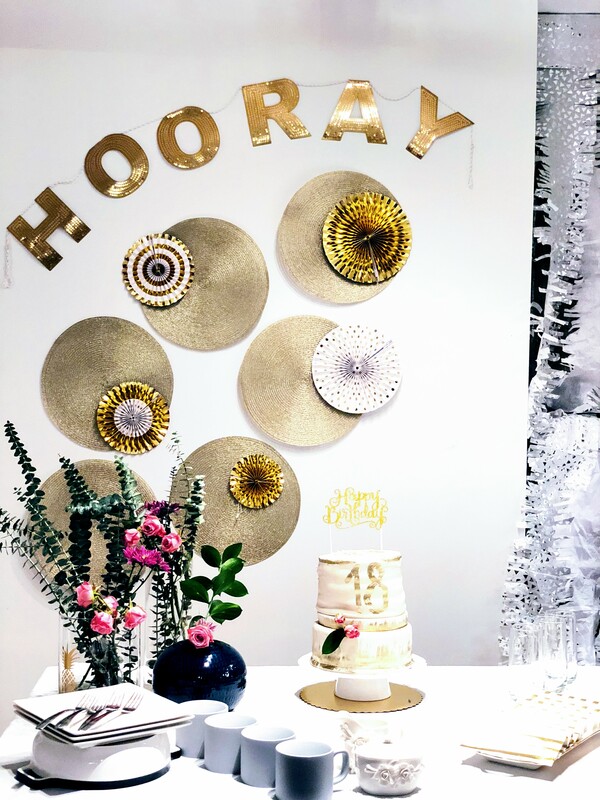 However, I wasn’t prepared to live in an empty looking space so I started a series of DIY projects to make our condo a functional, well decorated and happy living space. The first DIY in our first condo was creating a much needed shelf in our bathroom to put our toiletries, towels, toilet paper etc. I DIY-ed a hanging shelf then from a leftover long board from the kitchen install using a long piece of rope that we already had. THe created shelf was a completely free item which turned so stylish and chic, and for us was a life saver as it gathered all necessary bath stuff. These days also, I did a few hanging shelves which I needed for a project, and I want to share them with you the process so you may get inspired to make them too. It is an easy and supper fast project that can be finished in less than an hour. For this project you need a piece of board 45 cm long 15 cm wide (any size will work), cord, a ring, measuring tape to mark the openings for holes, drill for the holes, scissors to cut the cord. First you mark the holes and drill through the marks. To hang your shelf, cut two pieces of cord to your desired length, remembering to leave room for the knotted ends. I cut 2 pieces of 1 metre cord. Fold the two pieces in half, and place the folded end underneath the metal ring. Pull the folded end over the metal ring, then pull the rest of the cord up and through the loop. Separate two of the strands. Pull each strand through one of the drill holes. Repeat on the other side. Adjust the length of the cord to make your shelves hang as high or low as you want. Then, tie knots at the end of each piece of cord. Trim off the excess cord if needed, and hang your shelf. 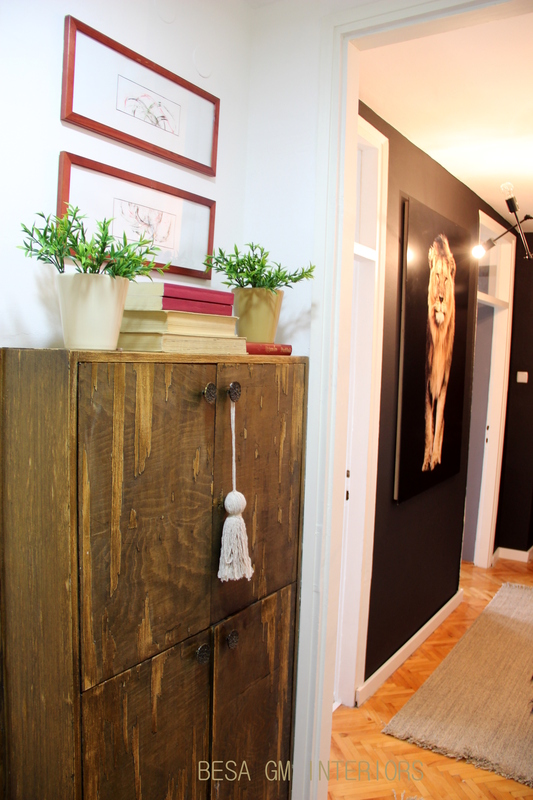 The result is a simple design that makes a big impact in your space, and the most important thing is that you did it yourself! If you make one please share it with me. I would love to see how your’s turned out. Gati tridhjet vite me pare, kur une dhe bashkeshorti im ishim duke e renovuar banesen tone te pare, e kishim hargjuar pothuajse tere fondin e parave te nevojshme per renovim dhe mobilim pas blerjes se elementeve te kuzhines dhe kolltuqeve te dhomes se dites. Jo vetem qe i hargjuam te gjitha parat, por pjesen me te madhe te blerjeve u dasht qe t’a paguajm me keste per nje vit. Pasi qe pothuajse e kishim shterur bugjetin tone per ate vit, mundesit per te blere gjera dekorative per zbukurimin e baneses ishin te vogla. Megjithate, une nuk isha e pergatitur te jetoj ne nje vend te padekoruar bukur i cili edhepse i mobiluar dukej si i zbrazet dhe pa jete; keshtu qe fillova me nje vazhde te projekteve te tipit Beje Vet (DIY) ne menyre qe t’i beja hapsirat e baneses sone me funkcionale dhe te dekoruara bukur. 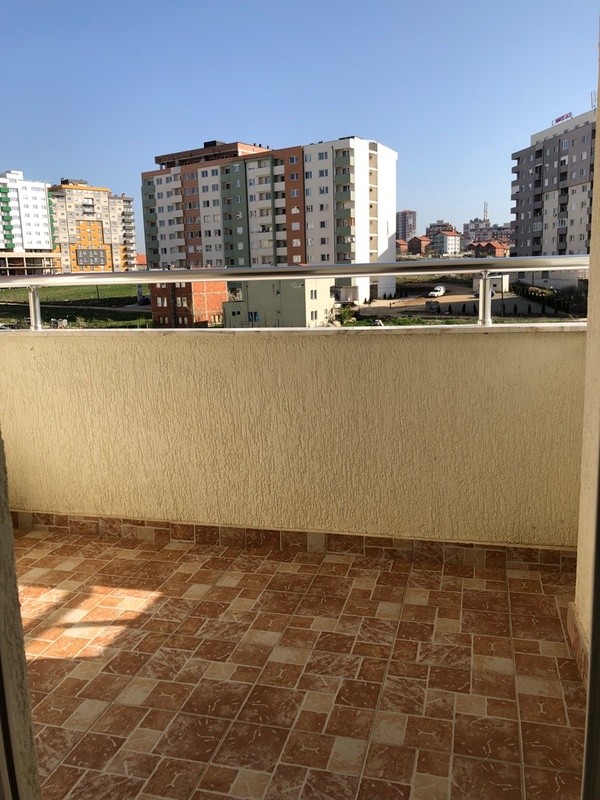 Projekti i pare i tipit Beje Vet ne banesen tone ishte punimi i nje rafti vares ne banjon tone i cili ishte me se i nevojshem per vendosjen e toileteris, peshkirave, letres toalet etj. Une e punova atehere nje rafte te tille vares duke e perdorur nje derrase e cila kishte tepruar nga instalimi i kuzhines, si dhe nga nje cope litari te cilin veqme e kishim. Rafti te cilin e krijova ishte nje gjesend qe nuk kushtoi asnje cent ( dinar ne ate kohe) dhe i cili rezultoi te jet shume i bukur dhe funkcional pasi qe ne te i grumbulluam te gjitha gjesented e nevojshme te toaletit. Keto dite, duke e involvu metoden Beje Vet, i punova disa rafte te tilla varese per nje projekt ne te cilin jam duke punuar dhe do t’a ndaj me ju, lexuesit e ketije bllogu, procesin e punes se krijimit te ketyre rafteve duke shpresuar qe kjo te ju inpsiroj qe edhe ju VET ta beni nje te tille. Ishte nje projekt shume i lehte dhe i shpejte i cili u kompletua per me pak se nje ore.
Materiali i nevojshem per kete projekt eshte nje cope derase me gjatesi 45 cm dhe gjeresi 15 cm (ose cfardo gjatesie ose gjeresie qe ju konvenon), nje unaze cfardo madhesije, litar ose cfardo shiriti tjeter sipas deshires, metri per caktimin e vrimave, drilli per hapjen e vrimave, gersheret per keputjen e litarit. Se pari i beni me shenje poziten ku do te hapen vrimat (ne kater skajet anesore te derrases) dhe me drill elektrik i hapni vrimat. Madhesija e vrimes duhet te korespondoj me trashesine e litarit. Per t’a krijuar pjesen varese te raftit, i preni dy fije te litarit ne gjatesi te cilen e deshironi, duke pase parasyshe qe te shtoni edhe pake gjatesi per nyjet qe do te lidhen perfundi derrases. Per kete projekt une i keputa dy fije te 1 meter gjatesi. Te dy fijet i beni bashk dhe i paloni ne mes duke e krijuar keshtu nje vegez siper se ciles e vendosni unazen. E terhiqni pakez vegezen e krijuar nga unaza dhe neper te i kaloni fijet e litarit. I ndani nga dy fije ne secilen ane. E kaloni secilen fije pertej seciles vrime ne te dy anet. 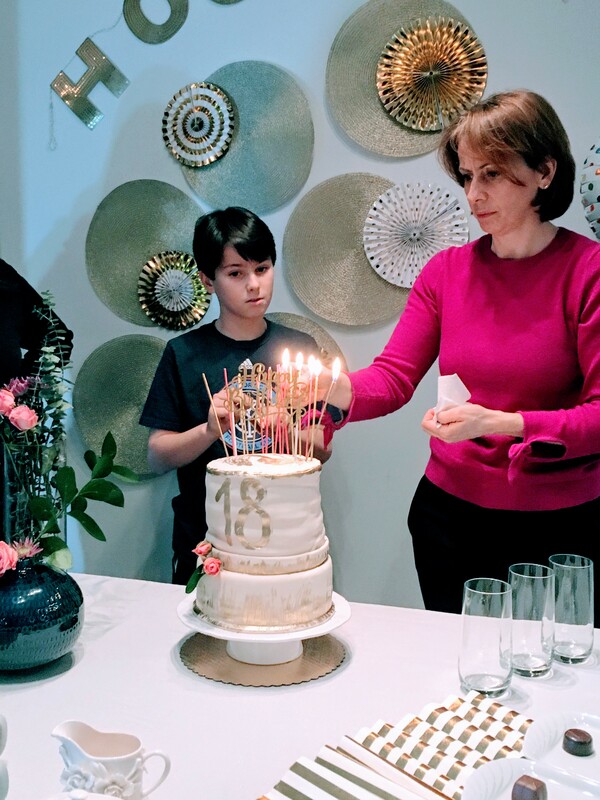 Bejeni nivelizimin e fijeve te litarit ne menyre qe raftet t’i varni ne lartesine e deshiruar, dhe pastaje secilen fije te kaluar neper vrime e lidhni ne nyje. I preni pjeset e teperta te fijeve nese ka nevoje, dhe e beni varjen e raftit. Rezultati eshte: nje dizajn i thjeshte qe bene impakt te madh ne hapsiren tuaj, dhe me e rendesishmja Ju e keni bere VET. Nese e Beni Vet nje te tille ju lutem me thuani se si doli i juaji. Ne Miremengjesi Kosove – RTK live, ku per shiquesit e ketije programi bera prezentiminnse si mund t’a punojme vet nje raft vares! Ju faleminderit qe e vizituat kete blog! 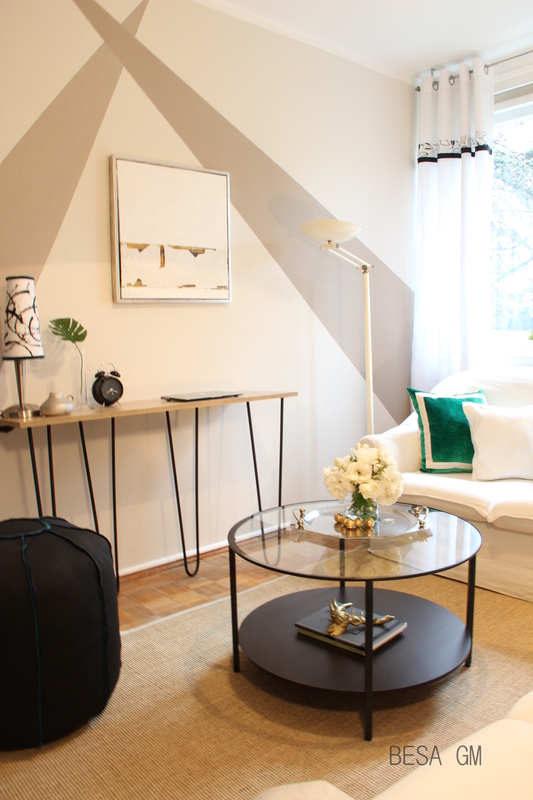 Every functional living room has or needs a coffee table. It is a necessary furnishing item in a room where we place our drinks, remotes, magazines or our books while reading etc. 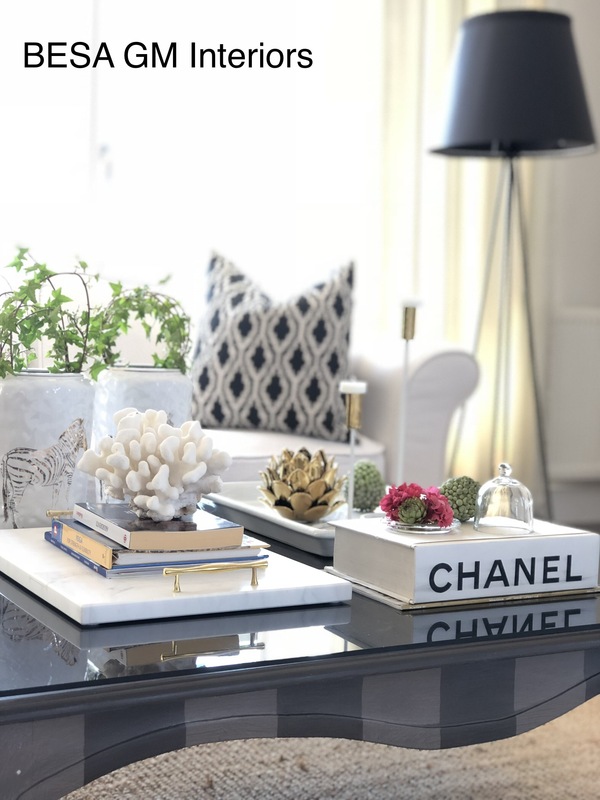 Since in most households the coffee table might be also a focal point of the room, it is a good idea to dress it up nicely so, beside its functionality, the well decorated table will bring some style and personality into a room. 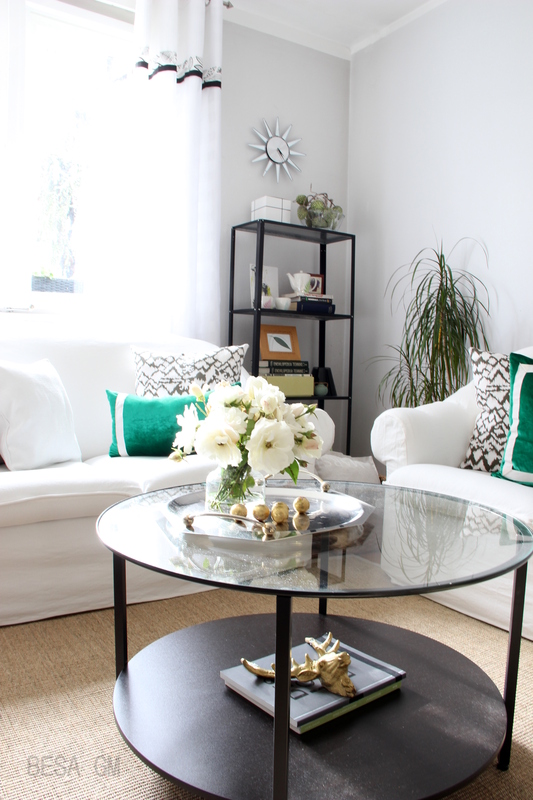 What to consider when styling a coffee table? 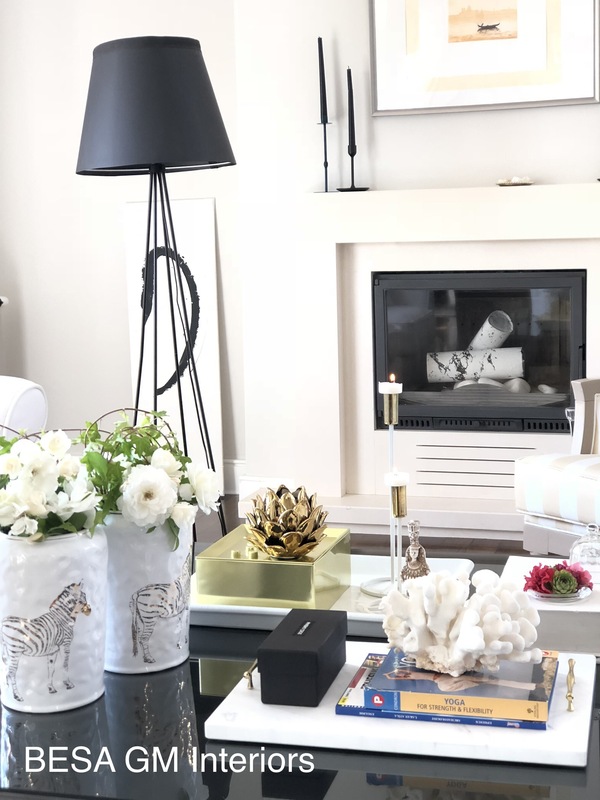 There are no strict rules as how to decorate a coffee table, as this always depends from the life style, creativity of a person, and other personal preferences for the coffee table use; however, for all those who aspire to have a well curated coffee table look it is good to know where to start to achieve that look. Decorating a coffee table is really simple, and you don’t need to go shopping for decorative items for coffee table decor. In most of the cases you can find those around the house. Books, specially those that inspire you or are a good conversation starters are always a god idea for a table decor. 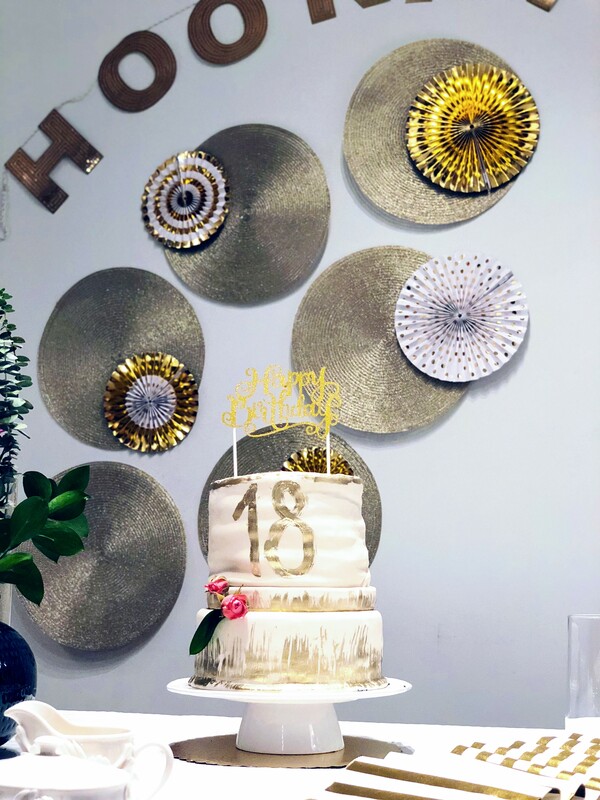 Stack them together so to create height and create visual interest. Way to stack the books together for a great look is to go with the largest one at the bottom and continue with the smaller at the top; this way we create height and add visual interest. While stacking them it is always good to look how those will look from the sides. 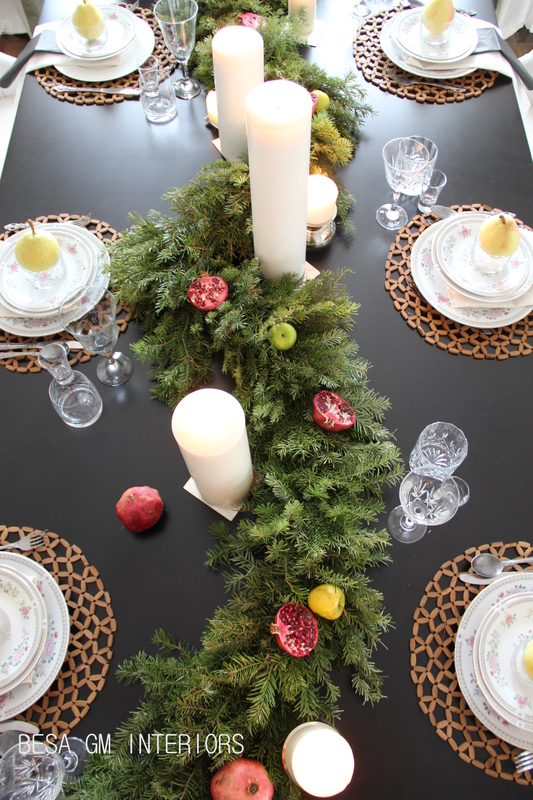 Tray is another classic item when it comes to table decorating. 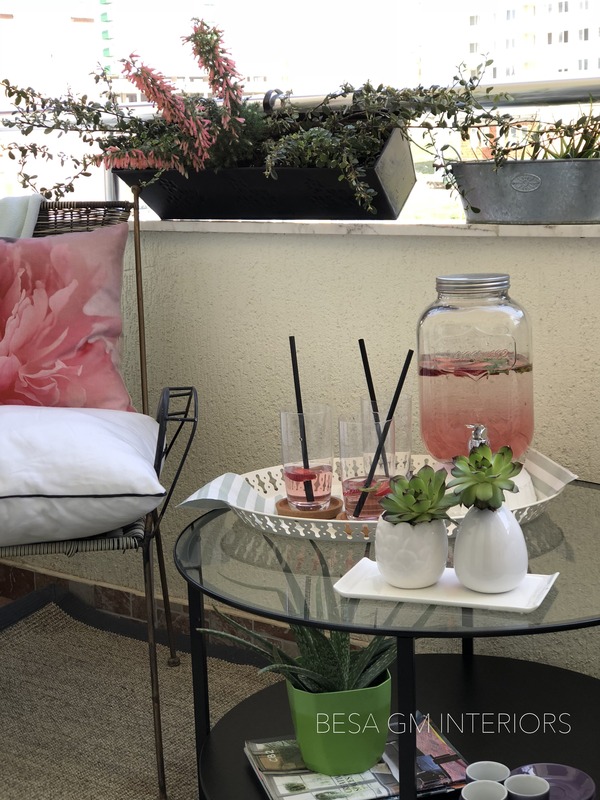 A tray serves both a practical and stylish purpose by showcasing your favorite small finds while also making them easily removable should you need to clear the surface for entertaining. A tray is also useful for giving structure and symmetry to a freeform table. Candles are another classic decorative item in coffee table decor. 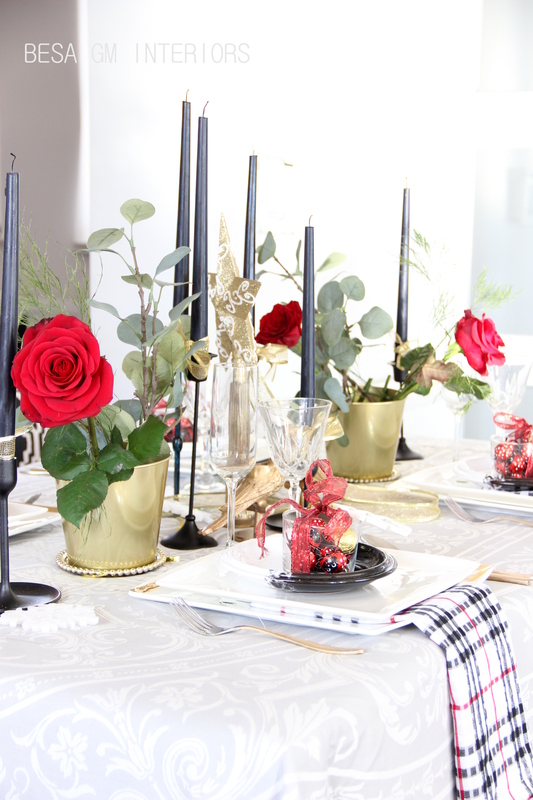 They create a warm ambiance, especially some good scented ones, so it is a good idea to incorporate them in our table decor. They come on various forms and styles making it possible to add a proportion, texture, height and style to a coffee table. When using scented candles I recommend not to use two or more different scented candles at a time as sometimes different scents mixed together may create a bad smell, thus ruining the enjoyment. It is non disputable fact that nobody can go wrong by using fresh cut flowers in table decor; and in my opinion, flowers should be a must in any coffee table decor. 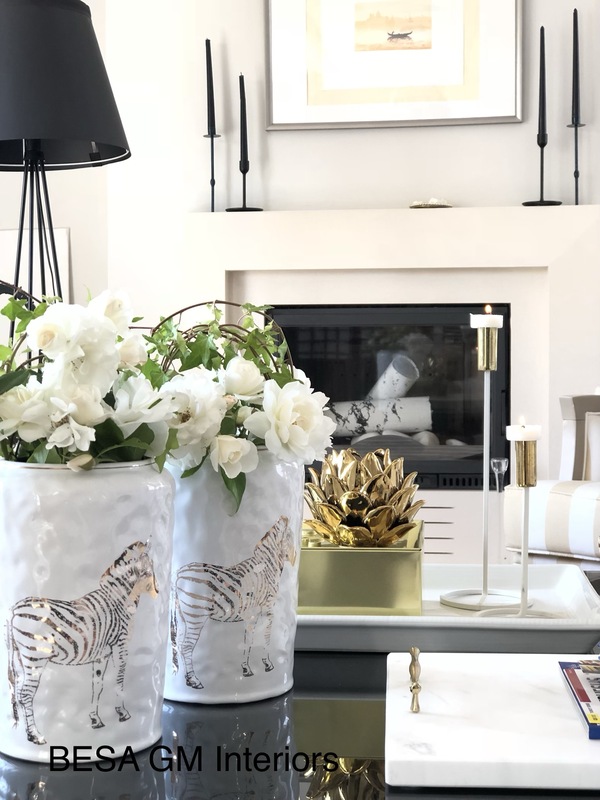 Flowers and plants add natural texture and color, and even the dullest coffee table may look pretty and styled by using a bunch of fresh cut flowers or a nice planted one. 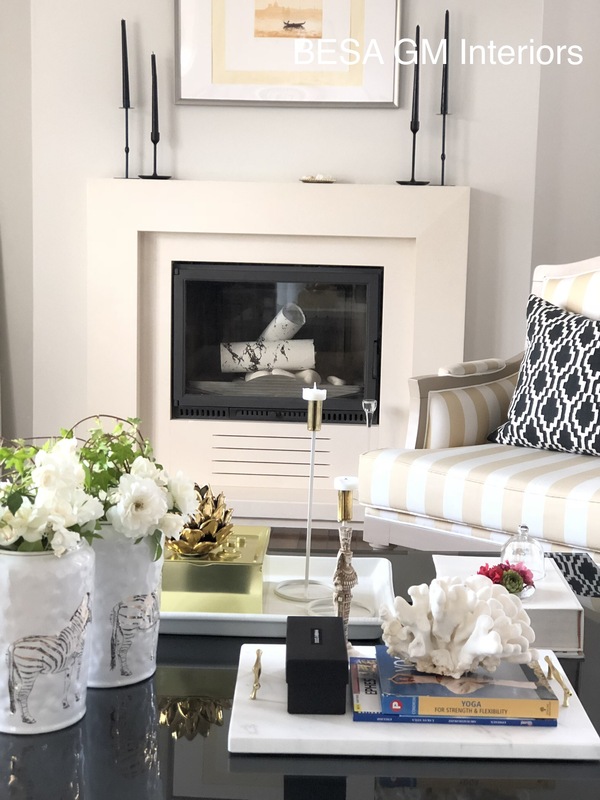 To create a stylish and meaningful coffee table decor, beside adding accessories that are also functional, consider adding an item which is personal to you as a homeowner. Personal items, such as small items for your memorable travels or vacations, an inherited item of a sentimental value etc. are a good conversation starters and make your coffee table decor look unique and personalised. So if you if you take into consideration the above tips such us using decorative items which vary on height ( created by a stack of books, flower vases , candles), using texture ( flowers and items with different forms and finishes) and by adding something personal, you are, without doubt, on a good track to create a great coffee table decor. Secila dhome funkcionale e dites e ka nje tavoline te kafes ose, nese nuk e ka, i nevojtet nje e tille. Eshte nje vend i domosdoshem ku mund ti vendosim gotat e pijeve gjat konsumimit te tyre, pastaje librat ose revistat e ndryshme si dhe teledirigjuesin e tv’s etj., dhe kjo ka te beje me ate pjesen funkcionale e tavolines se kafes. Pasi tek shumica kjo tavoline munde te jet edhe pjesa fokale ne dhome, atehere do te ishte ide e mire qe ate t’a dekorojme bukur, ne menyre qe perpos funkcionalitetit, dekori i saje do te sjelle stil dhe personalitet ne ate hapsire. Cfare te konisderojme me rastin e dekorimit te tavolines se kafes? Nuk egzistojne regulla specifike se si te behet dekori i nje tavoline te kafes, sepse kjo gjithehere varet nga stili i jeteses se personit, kreativitetit, preferencave personale etj. ; megjithate, per te gjith ata te cilet deshirojne ta ken nje pamje te kuruar te tavolines se tyre te kafes, atehere eshte mire te dijne se nga t’ja fillojne per t’a arijtur nje dekor te bukur qe ata ose ato e aspirojne. 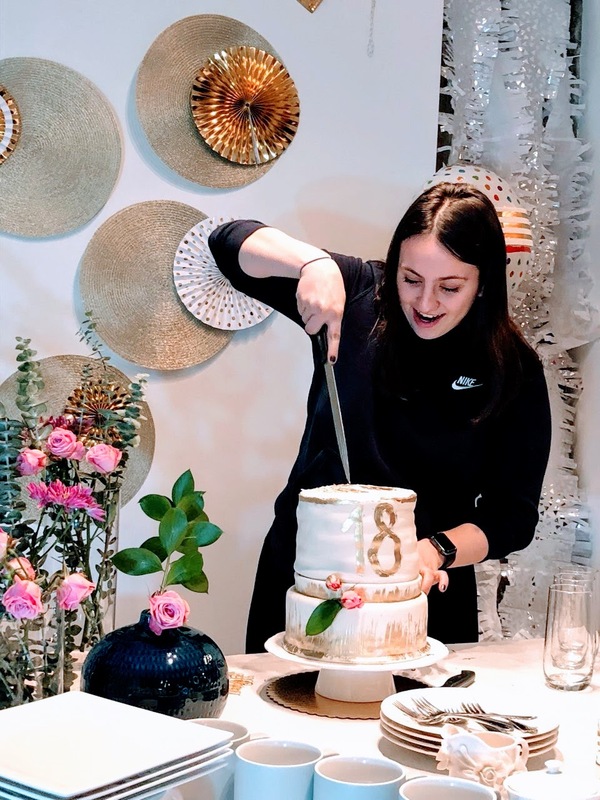 Edhepse per disa dekori i tavolines eshte art ne vete, per te gith ata te cilet deshirojne qe ta ken nje dekor jo edhe aq extravagant, dekorimi i nje tavolineje te kafes eshte shume i lehte; dhe, shumica prej nesh nuk kan nevoje qe domosdoshmerisht te blejne gjesende dekori per kete qellim. Ne shumicen e rasteve ato gjesende dekorative do ti gjejne ne shtepi. Librat, e posaqerisht ata qe na inspirojne ose jane inicues te mire te bisedes, jane gjithehere ide e mire qe te jene pjese perberse e dekorit ne tavolinen e kafes. Dhe libra kemi qe te gjithe, edhe pse ndoshta jo ato nder me luksozet te botuar enkas per t’i vendos siper tavolines se kafes. Lbrat e perzgjedhur I radhisim njerin siper tjetrit ne menyre horizontale duke filluar nga me i madhi i vendosur ne pjesen e poshtme, dhe duke vazhduar me te vegjlit siper; ne kete menyre ne krijojme lartesi dhe interesim visual. Gjate radhitjes se tyre eshte mire te shiqojme se si po perputhen ngjyrat e kopertinave dhe si duket radhitja nga anet tjera. Qirinjet jane nje tjeter element dekorues shume te perdorur siper tavolines se kafes. Perdorimi i tyre krijon nje ambient te ngrohte, e sidomos perdorimi i qirinjeve aromatik, andaje eshte mire qe t’i inkorporojme qirinjet ne dekorin e tavolines. Ata i gjejme ne forma dhe madhesi te ndryshme duke e bere keshtu te mundshme qe me perdorimin e tyre te shtojme proporcion, stil, lartesi dhe teksture ne dekorin e tavolines. Nese perdorim qirinje aromatik, atehere rekomandoj qe te kemi kujdes dhe mos ti ndezim ne te njejten kohe qirinjet me aroma te ndryshme, pasi qe aromat e tyre mund te mos lidhen mire me njera tjetren dhe si pasoje te kemi nje ere te pakendshme qe pastaje e prishe ate ndjenjen e kenaqesis se perdorimit te tyre. Eshte fakt i pamohueshem se askush nuk mund te gaboj me inkorporimin e luleve ne dekorin e tavolines se kafes dhe, sipas mendimit tim, perorimimi i luleve te fresketa do duhej te ishte imperativ ne dekorin e tavolines. Lulet e fresketa dhe ato ne saksi shtojne teksture dhe ngjyre, ashtu qe edhe tavolina me e thjeshte dhe mbase edhe me e vjetruara do te duket e bukur, e fresket dhe me stil nese ne te eshte e vendosure nje buqete lulesh ose ndonje lule ne saksi. Per nje dekor me shume stil rekomandoj te behet akcesorizimi me gjesende dekoruese te cilat perpos qe munde t’a ken nje funkcion ne tavoline, ato kan edhe nje sentiment per ju. 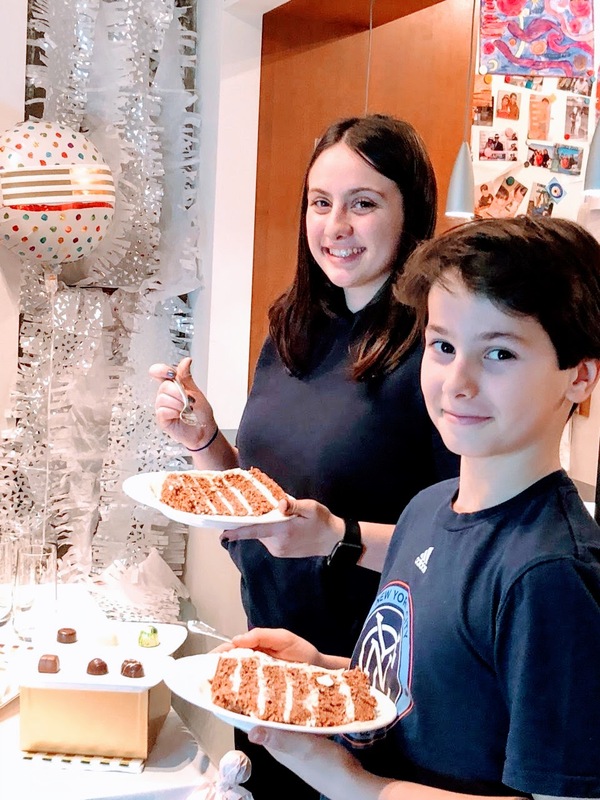 Keto munde te jen gjesende interesante te sjella nga ndonje udhetim, ndonje gjesend i trasheguar nga familja, ose gjera te tilla personale te cilat munde the jen gjithashtu edhe inicues te bisedes, dhe per me teper e bejne qe dekori i tavolines s’uaj te kafes te duket me unik dhe i personalizuar. Andaj, nese i merni parasysh keshillat e siperme s’i; perdorimi i gjesendeve dekoruese te lartesive te ndryshme (qe munde te arrihet me perdorimin e librave te radhitur njeri siper tjetrit, vazo te ndryshme, qirinjeve me lartesi te ndryshme); perdorimi i teksturave (lulet e fresketa dhe ato ne saksi, si dhe gjesendet me forma dhe finishe te ndryshme), si dhe duke e inkorporuar ndonje gjesend personal ne ate dekor, padyshim se ju jeni ne rruge te mire per te krijuar nje dekor mbreselenes te tavolines s’uaj te kafes. If you think that a granny square crochet pieces are outdated and that the idea of incorporating them in your home decor projects can make your space look so granny, than think again! 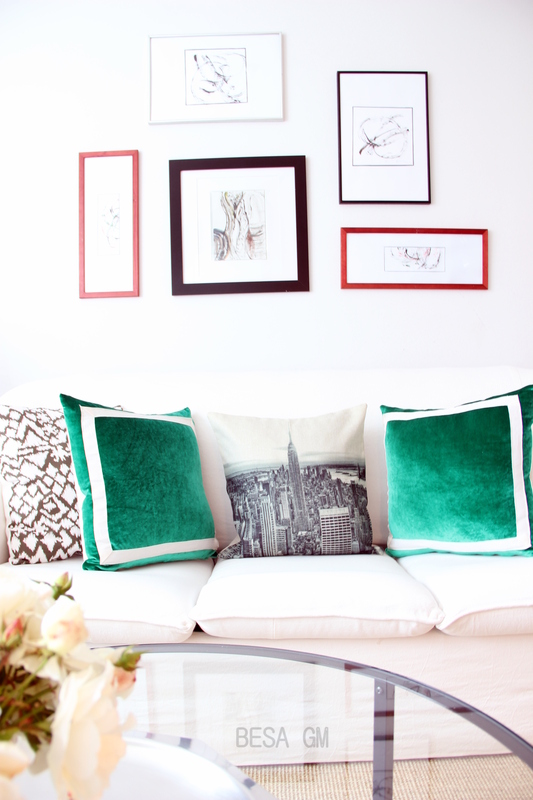 These fresh looking crochet pillows that were used in this balcony makeover tell us just that! 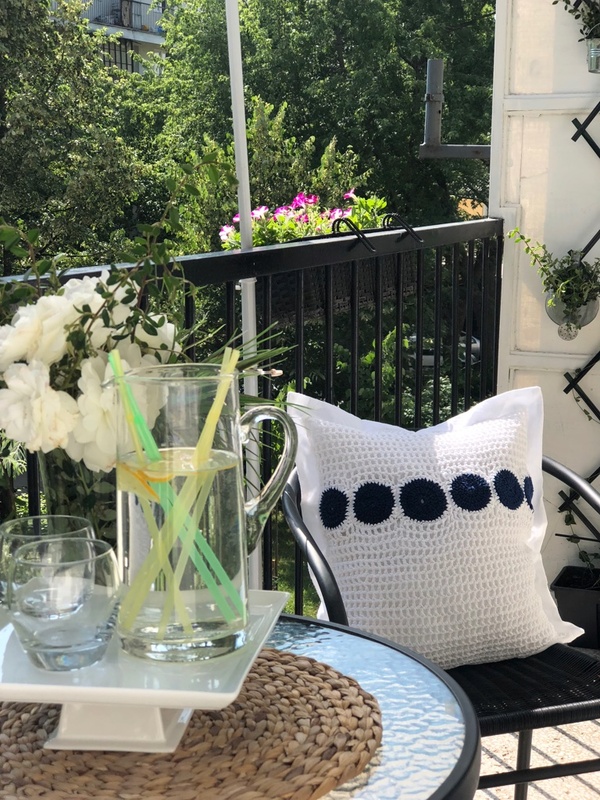 This “granny” balcony situated in an old city building from a communist era with it’s odd shape (supper long and extremely narrow) was a good candidate for a makeover using these crochet pillows from my Summer Pillow Collection 2018! 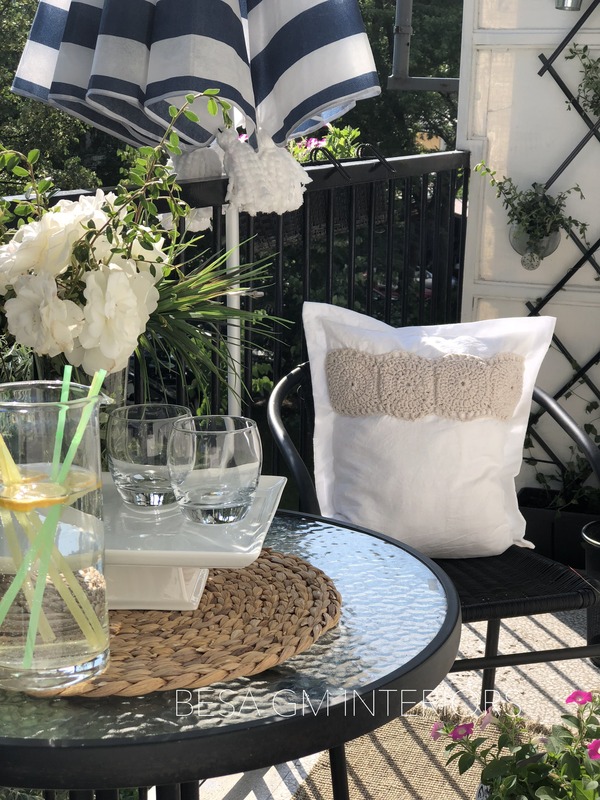 Using some used outdoor furniture, some inexpensive decorative items and by incorporating these crisp crochet pillows, I turned this outdate looking balcony into a cool place to chill during hot summer days. 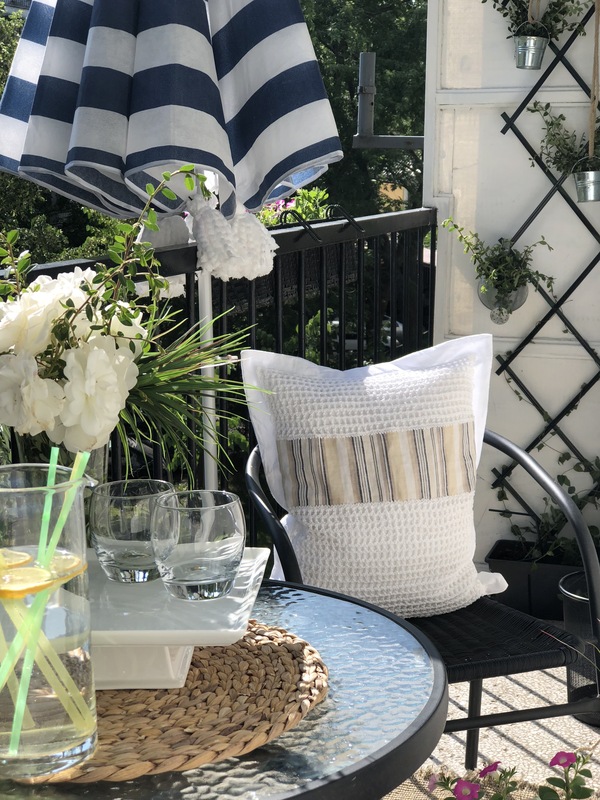 The hand made front crochet pillow pieces are made of 100% cotton yarn and attached to pre washed 100% organic white cotton fabric and they were part of my pillow collection – Summer 2018. 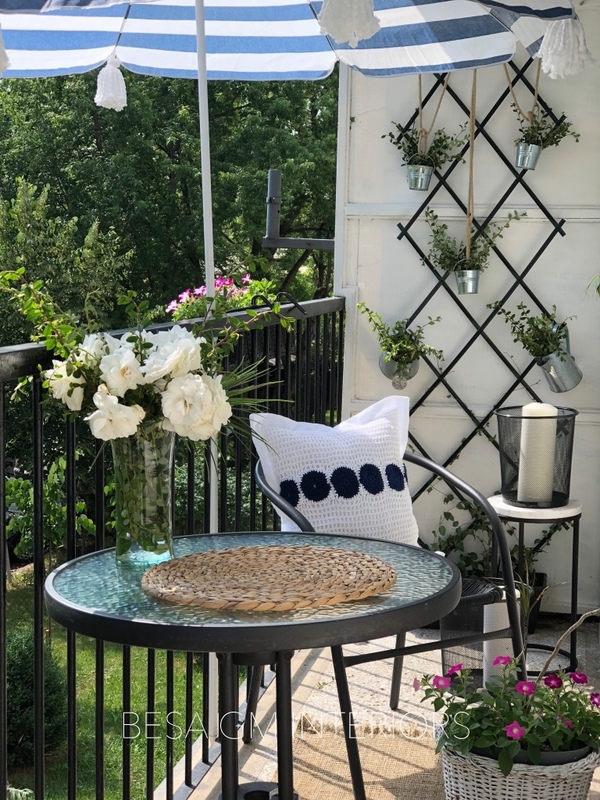 These old fashioned pillows made this balkony look fresh and modern despite its odd shape and “age”; so, never underestimate the power of granny chrochet squares. To order pieces from this collection write us at besagmblog@gmail.com! We love to make your spaces looking great for less! There is a lot to dislike when it comes to renovations and the process one has to go through it. It is a lot of mess, dust, debris and what not; but what is to love about them is how rewarding they can be. No mater how messy and difficult renovations may turn, I still love them and I do not hesitate to undertake such projects because I just love that feeling when some not so pretty spaces, and may I say sometimes pretty ugly ones, turn into a loving space to cherish and enjoy in years to come. 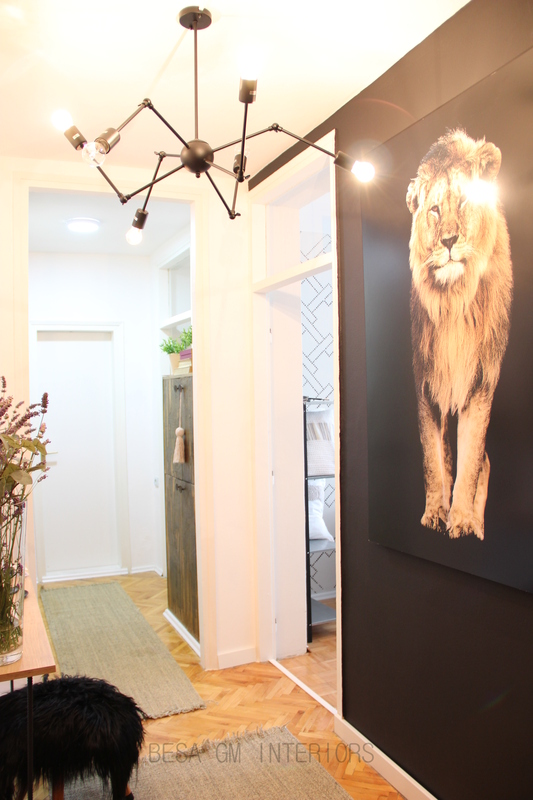 Couple of months ago I was involved in an apartment entryway renovation, which exactly proves what I just said above. 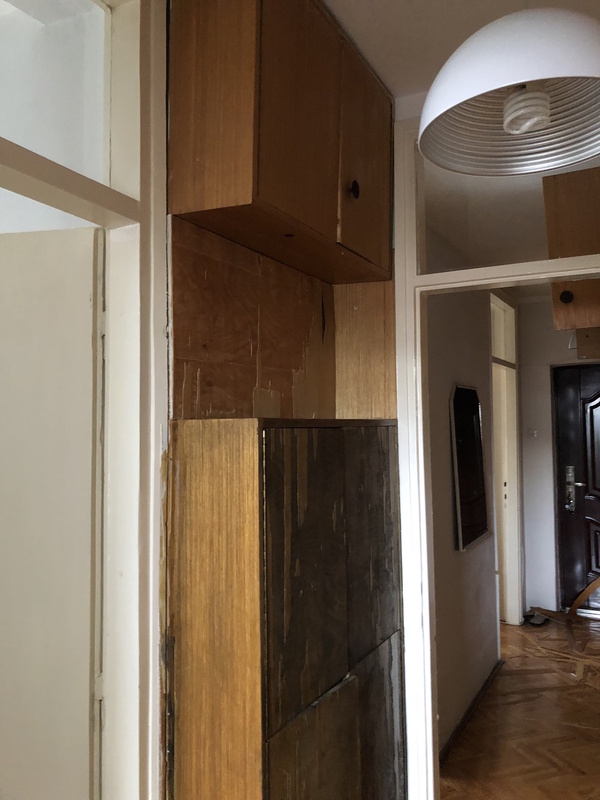 It is a 60’s apartment with an entryway which is quite narrow and long, providing the entry into 2 bedrooms and the livingroom/kitchen on the right, and the bathroom at the front. On the opposite side from the doors there were built in storage and wardrobe cabinets and I am sure that in the 60’s this looked nice and pretty, but almost 60 years later it was time for a big change. 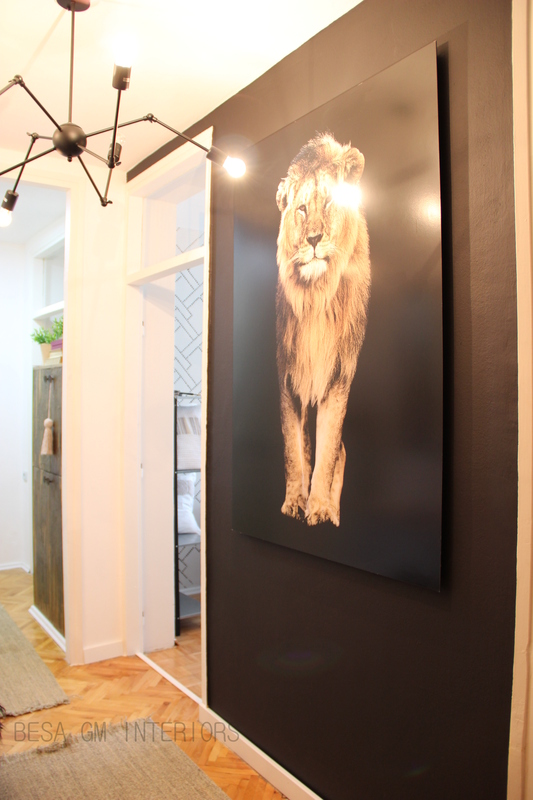 I worked on a very small budget which allowed only for the new front door cabinets,paint, light fixtures, and the Lion wall art. There was no money left for the labour so I had to undertake the cleaning and paint job myself. Yes, it was a lot of work, mess, dust and a lot of sweat but, after two weeks of intense labour, everything looked so different, pretty, neat and clean. 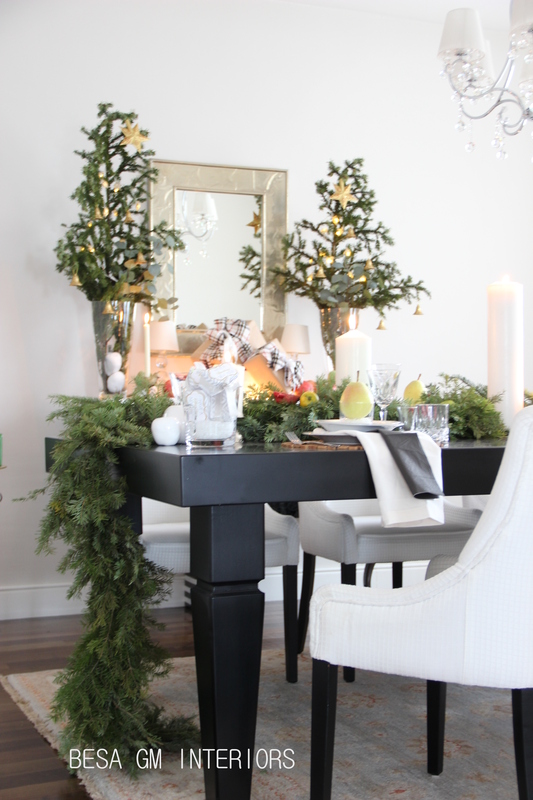 The mirror used in this project is the existing one and it was DIY-ed for this project. I will share this DIY in my future postings. 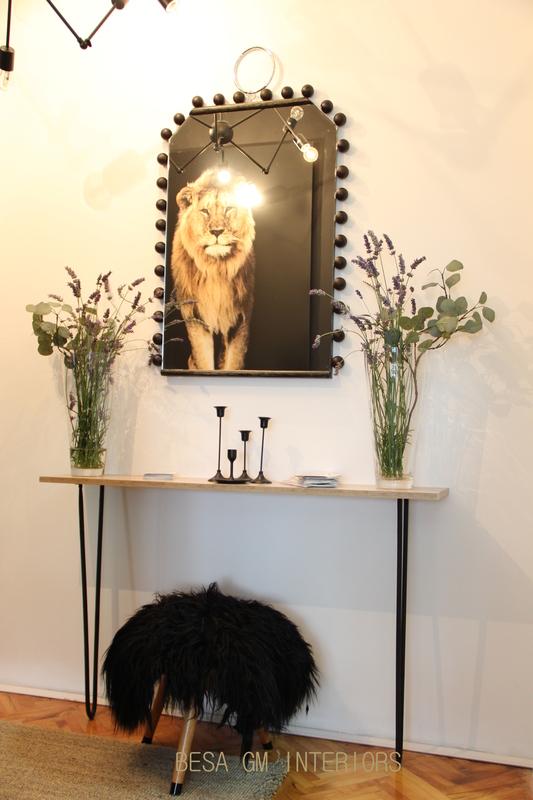 The console table is an DIY from another project and it used to have four pin hair legs. I DIY-ed it, again, for this project by altering the top and removing two of its legs. 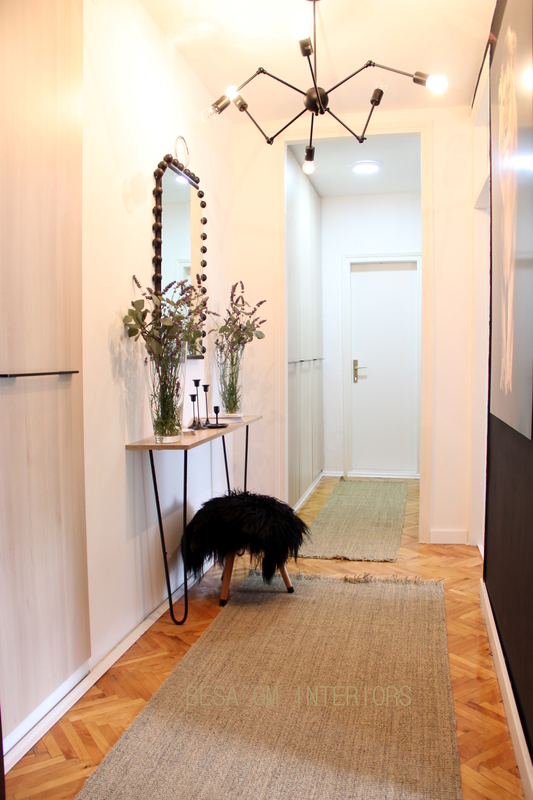 The entryway runners were created from an existing sisal rug; another DIY which I will be sharing in my future postings. 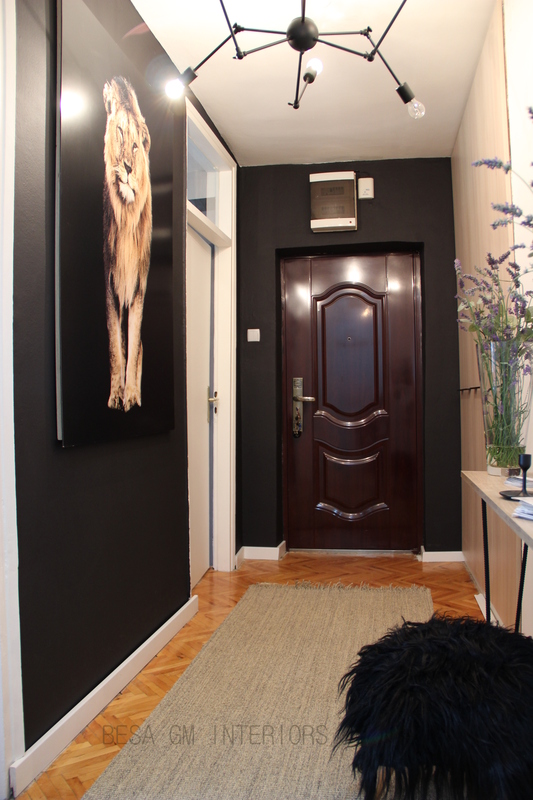 This entryway now looks much brighter, clean and neat, just what it is needed for my new interior studio space. 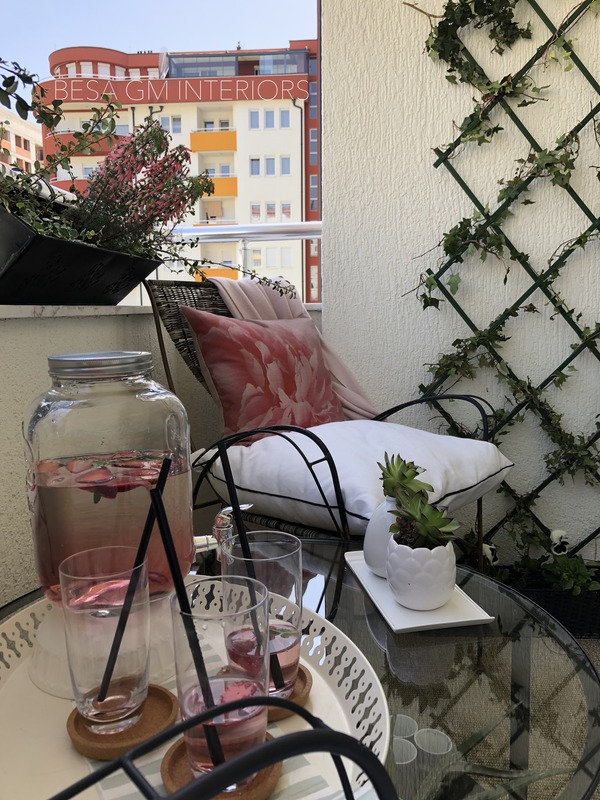 I will be running my Home Decor styling busines from this location in the vicitinity of the city center. Although, short in square fottage compareed to my previous studio space, this one has more central location with the plenty of parking space neearby, something that my previous studio space lacked. Thank you for checking this page! 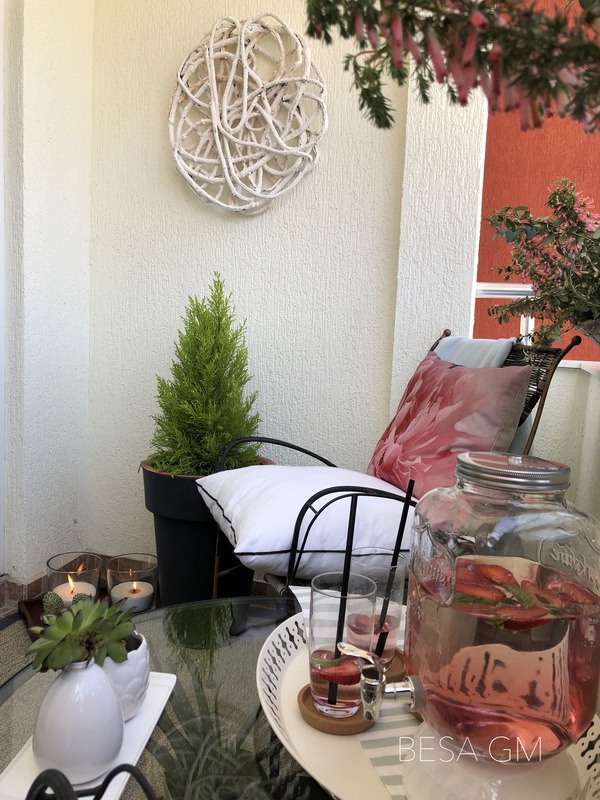 Not everyone has an outdoor private space who would be able to go outside and enjoy the fresh air, step in green gras,have a favourite drink among trees and smell the flowers. 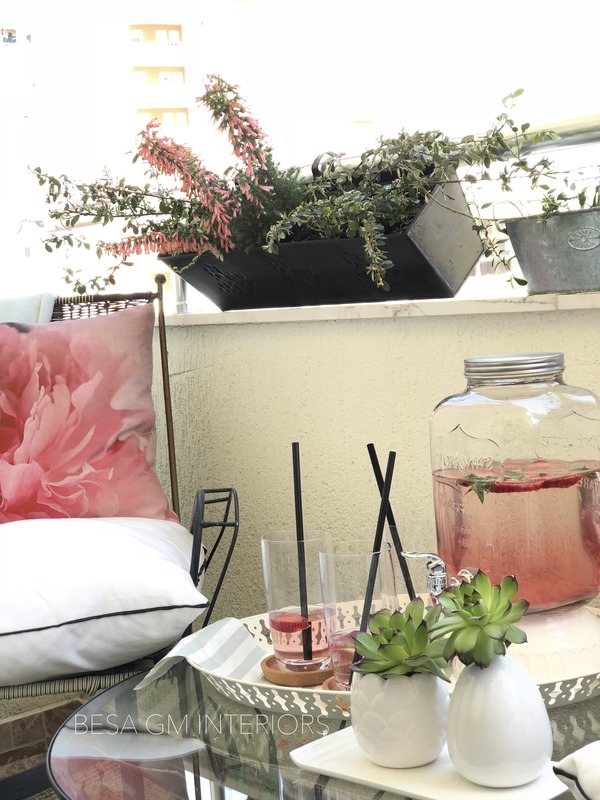 However, most of us have a balcony and no matter how small it is we can make it a cosy functional living space, and by adding some greenery, flowers and summer accessories we can turn it into an urban oasis to enjoy it all summer along. 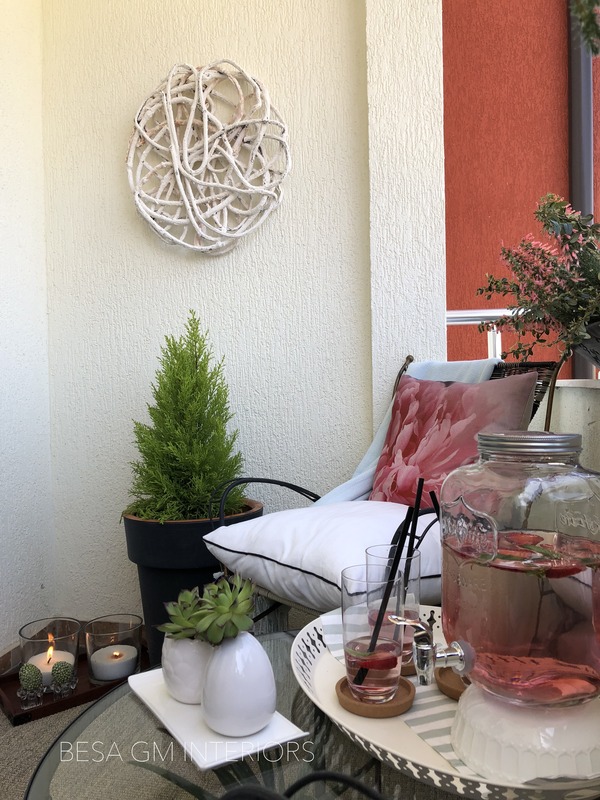 So how to create an inviting outdoor living space in our small balconies where we can’t wait to return from our long day of work and have our well deserved favourite drink? 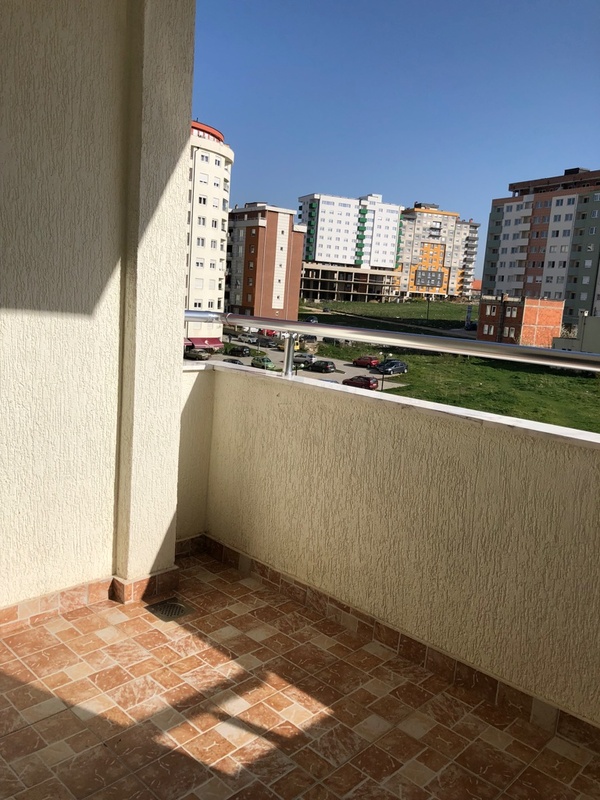 First, start by planing which layout of furniture would fit best to your balcony situation, number of people that need to be accommodated on a daily basis, the privacy issues and the sun exposure that may need to be addressed and so on. After considering all these factors we ca make a better decision on what furniture to choose and how to lay those pieces out. 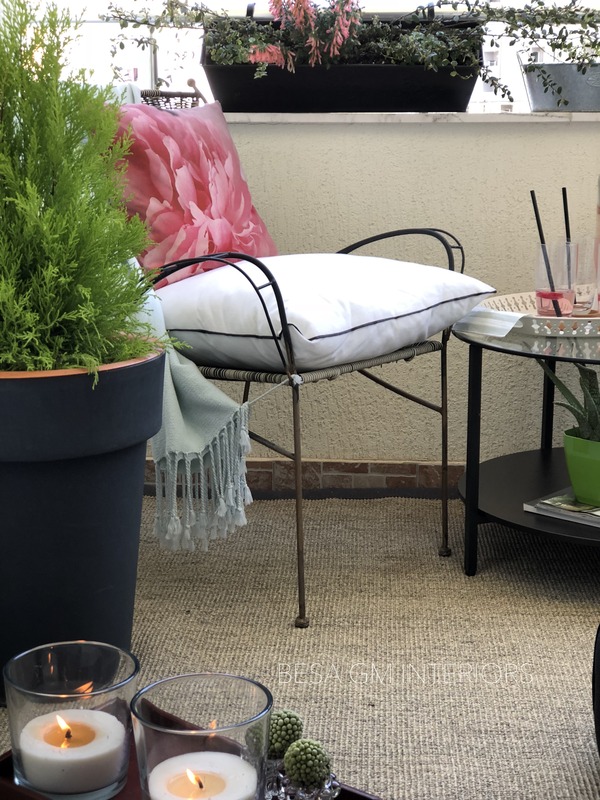 When choosing the furniture the comfort is the key when it comes to your apartment’s outdoor space, so adding comfortable seating will turn your outdoor space into the perfect place to lounge. 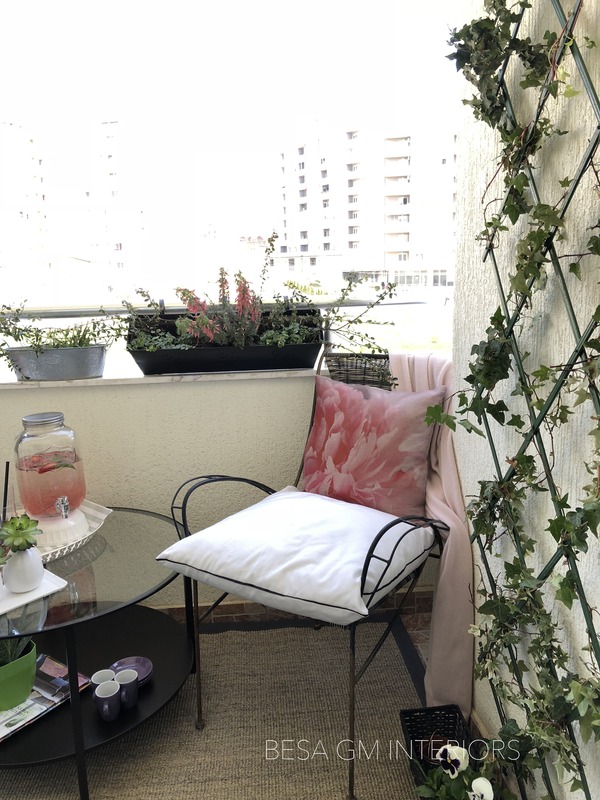 This is exactly what I applied in this small apartment balcony which I styled early this spring. I used two existing old iron garden chairs and elevated them to a supper comfy seating by adding fluffy custom made cushions. 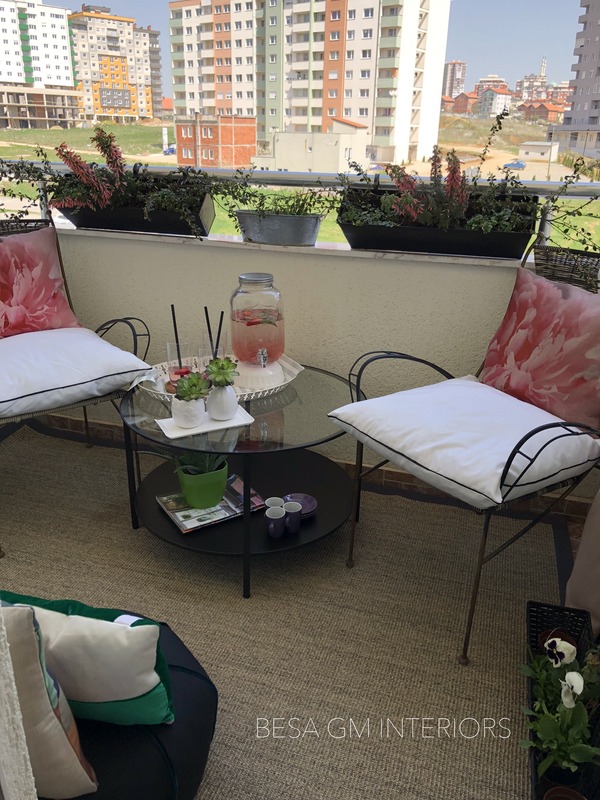 After choosing the furniture, start adding pops of colour to your balcony. 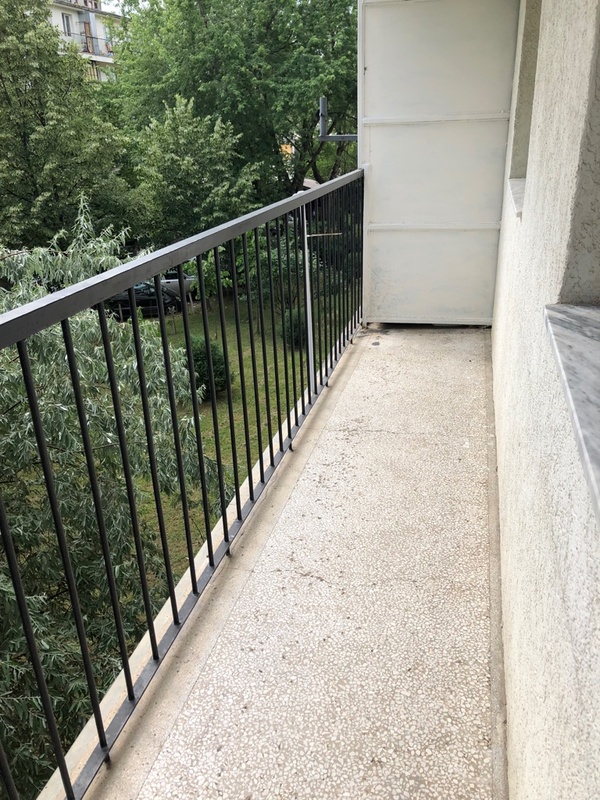 Nothing brings a balcony more to life than fun accent colors. Be bold with your outdoor accessories by incorporating bright, cheerful colors that will put a smile on your face every time you step outside. If you prefer a more neutral setting, try picking one color to highlight through decorative pillows and flowers. 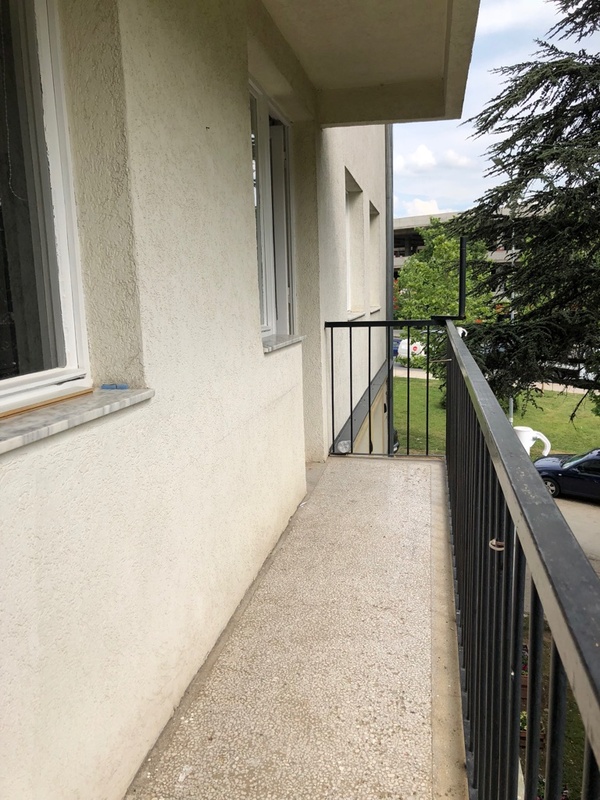 This is what I applied in this balcony. 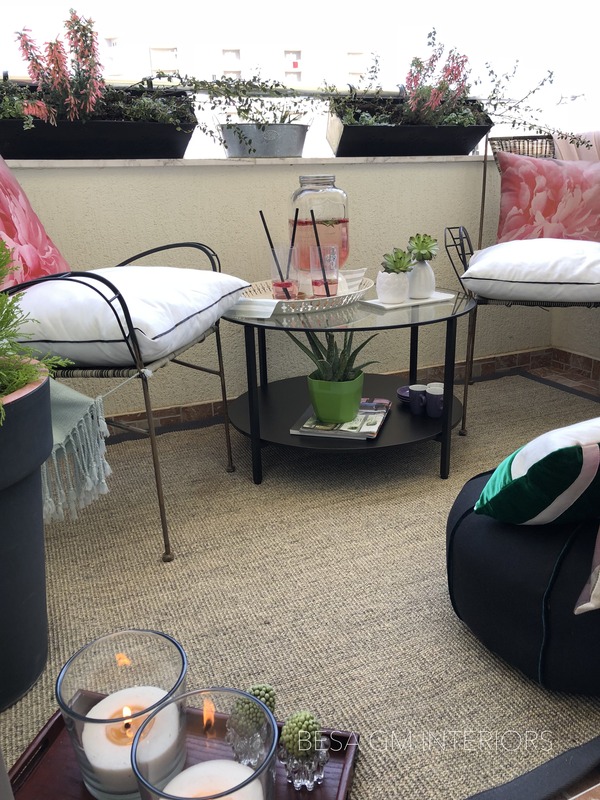 To cosy up the space and to maybe address the flooring issues (not so pretty tiles or old surfaces) that you may have, adding an outdoor area rug or a runner could be a good solution. 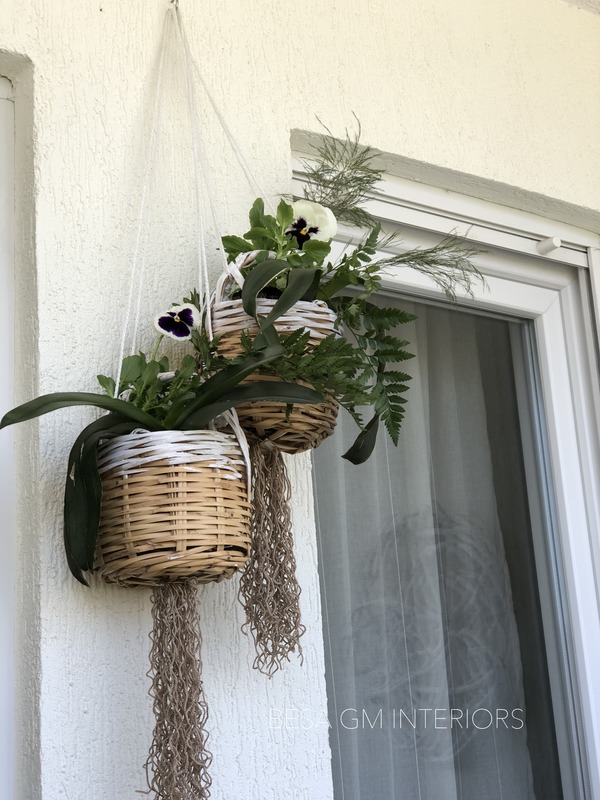 This will add warmth and will make your balcony more inviting. This is also a great opportunity to incorporate some texture (like a natural fiber rug), color, or a pattern for some character. No outdoor space is complete without plants and flowers, so the next step is to create a small garden. Just because you don’t have a backyard to grow a garden, doesn’t mean you have to put an end to your green thumb. 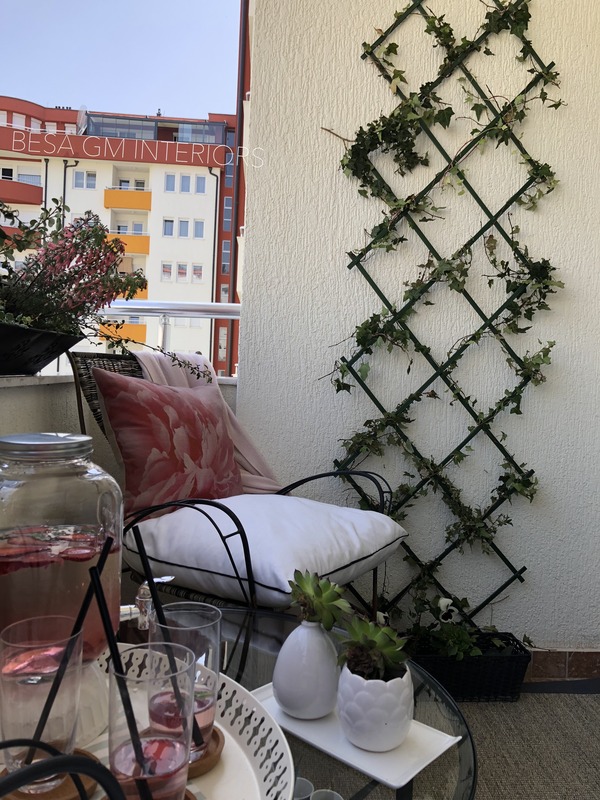 Create your own small garden on your apartment balcony by DIYing a wall planter, like this lattice which can either provide support to an ivy planted in a small planter or you can be more creative and hang other plants such succulents, various ferns or herbs. 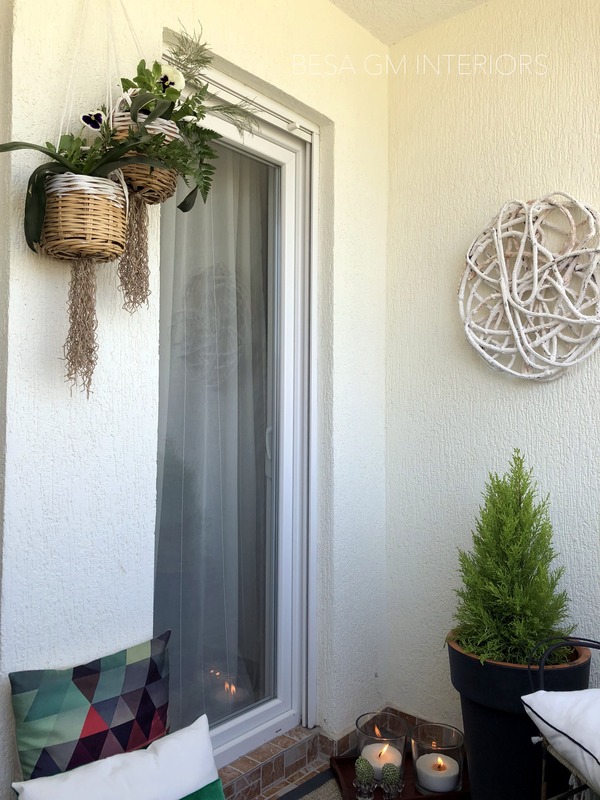 And lastly bring on the accessories such as wall hangings, candles, jars and everything else that will make your balcony look pretty, and things that you will be using while spending time in it. 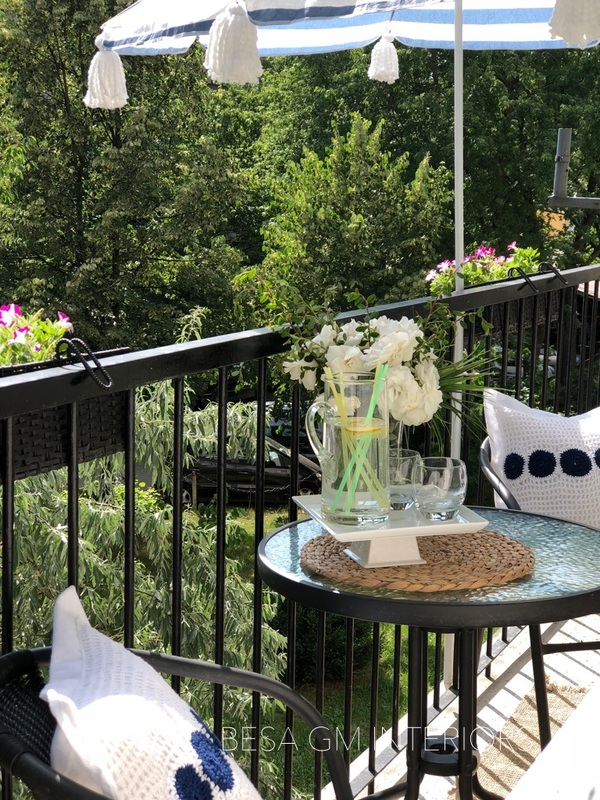 Once complete, I assure you that, your well styled balcony will turn into an extra cozy space to unwind in after work, or a spot to entertain friends and family all summer along. 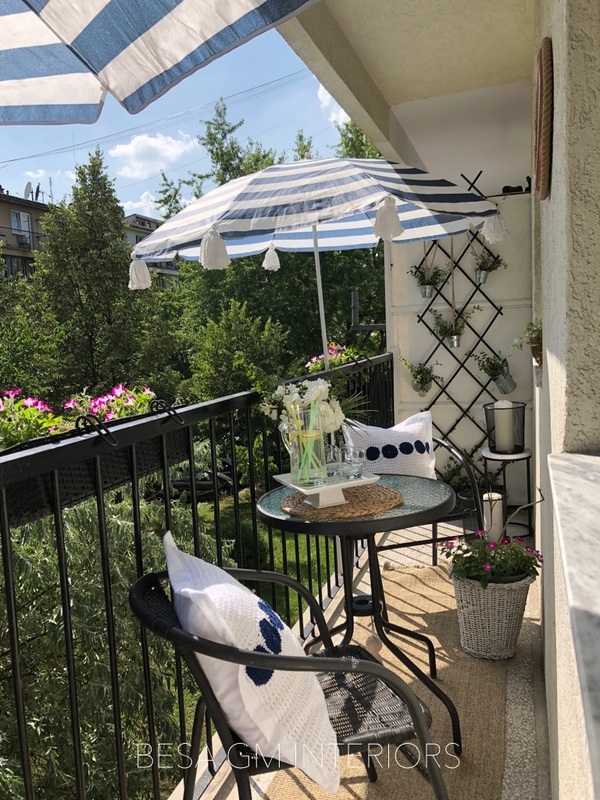 Tips on decorating this small balcony were featured on IMAZH RTK show. Thank you for stopping by and visiting this page! On my previous post I talked about how and why I ended up in NYC at this time of year. Usually I go there at Chrismas time, but this time was for a special occasion. Beginning of February my niece Hana, was about to turn 18th so she demanded that I fly to NYC to celebrate her birthday together. I promised her that I would be there on her birthday, and that I will even make her a fancy birthday cake. I was as a bit nervous about how the cake will turn out but at the end Hana liked it and this is what matters. It was a chocolate cake with white butter cream inside, and it tasted delicious. Outside it was wrapped in beige fondant! It was my first time that I worked with fondant and, to make things worst, I had a small amount of fondant to work with. 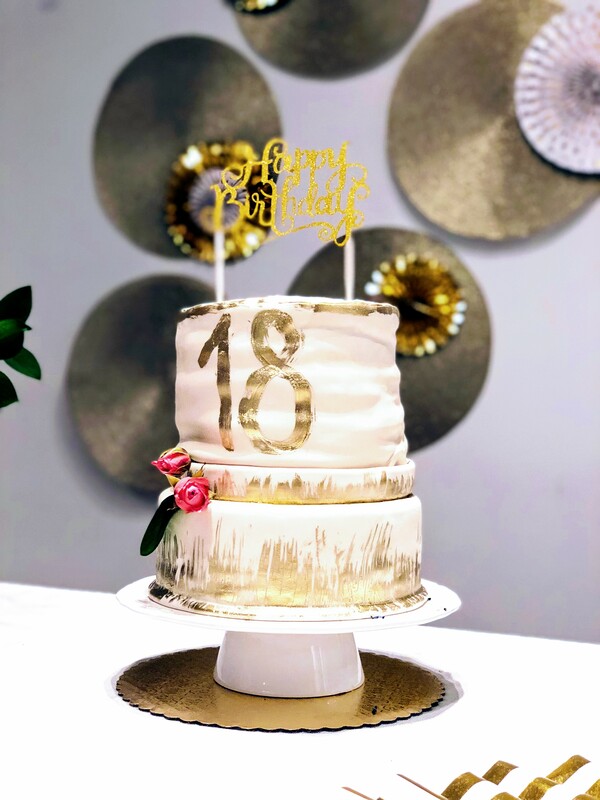 This made the decoration process a bit challenging for me; however, at the end the cake turned pretty. Not so perfect, but certainly cute and fancy! 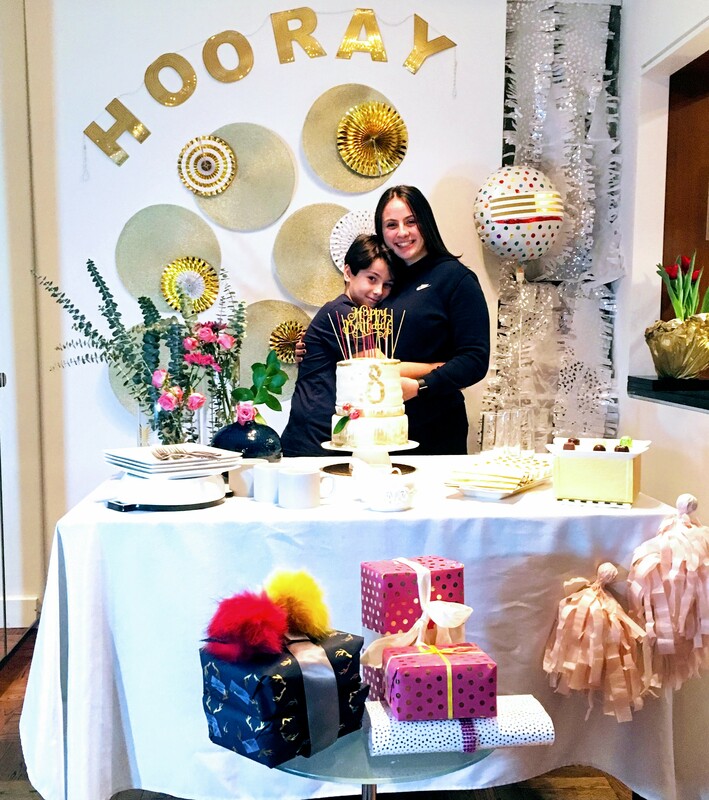 Hana was at school at the time we baked the cake and decorated the table and the backdrop, so when she returned home she was pleasantly surprised and liked everything what we did. She even became emotional, so we saw a few happy tear drops on her beautifull smily cheeks. I knew Hana’s taste. 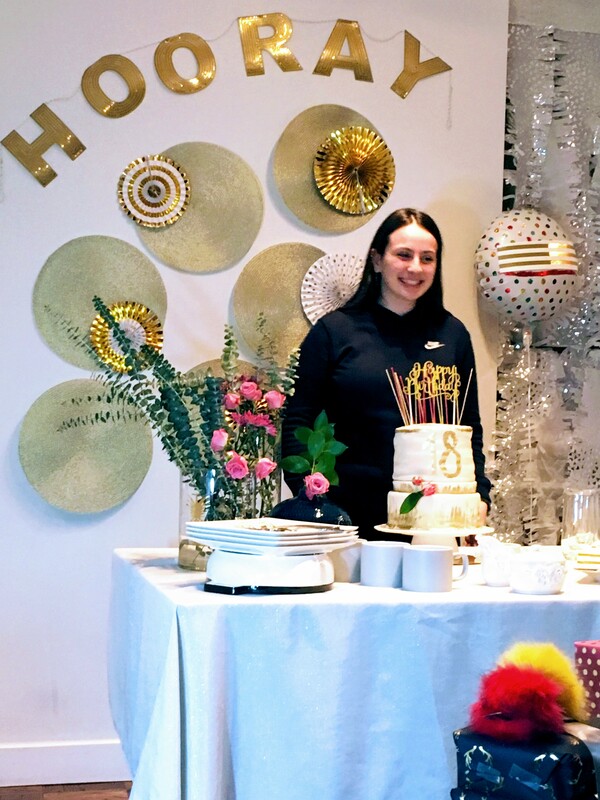 She doesn’t like things to be over the top, in this case over the top decor. She would find it kind of “cheesy”, so I had to be carefull to not cross that line which would make the decoration seem “cheesy” to her. 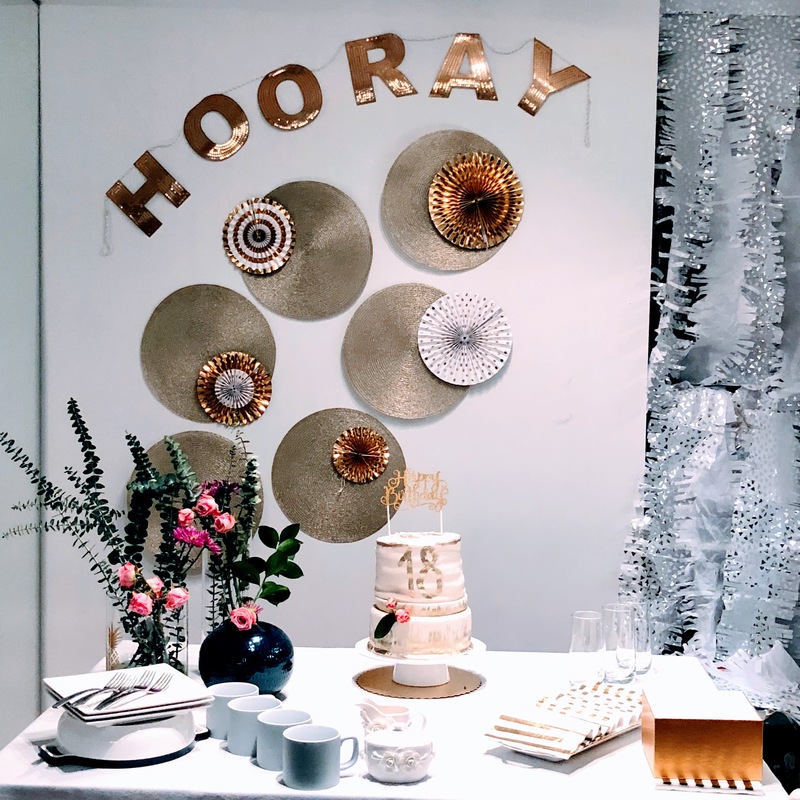 For backdrop decoration we used gold round placemats we had at home, fancy pinwheels and HOORAY lettered sign purchased at Target, some tissue paper cut in wide stripes and fringed at both sides lengthwise which were hung at the right side of the wall. 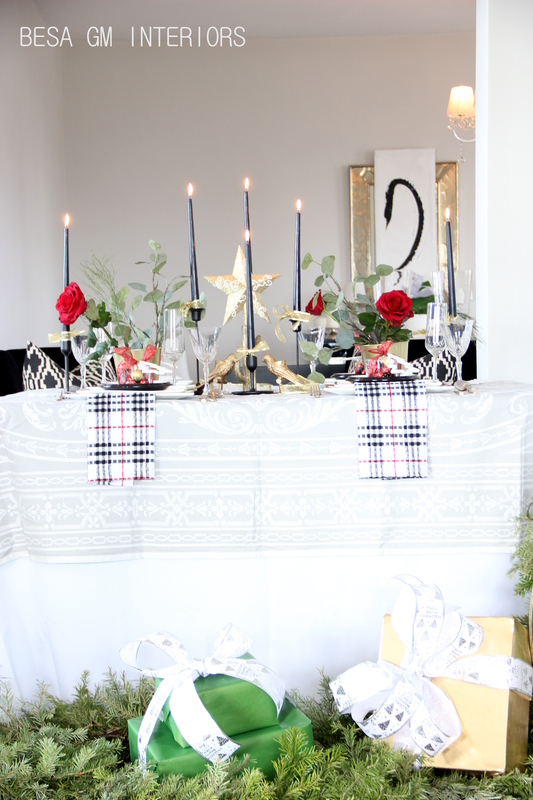 It was a very simple set up but it turned very pretty and effortlessly stylish. Here are some of the photos from the celebration. 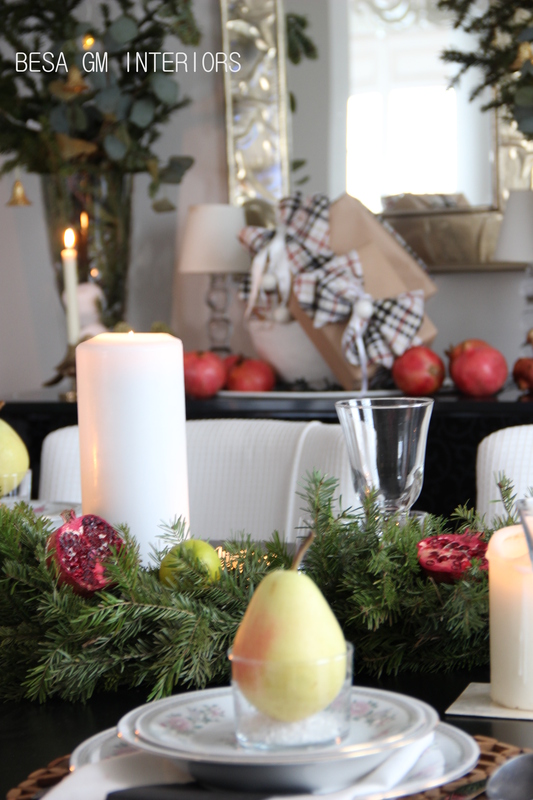 And later on she oppened the presents…. 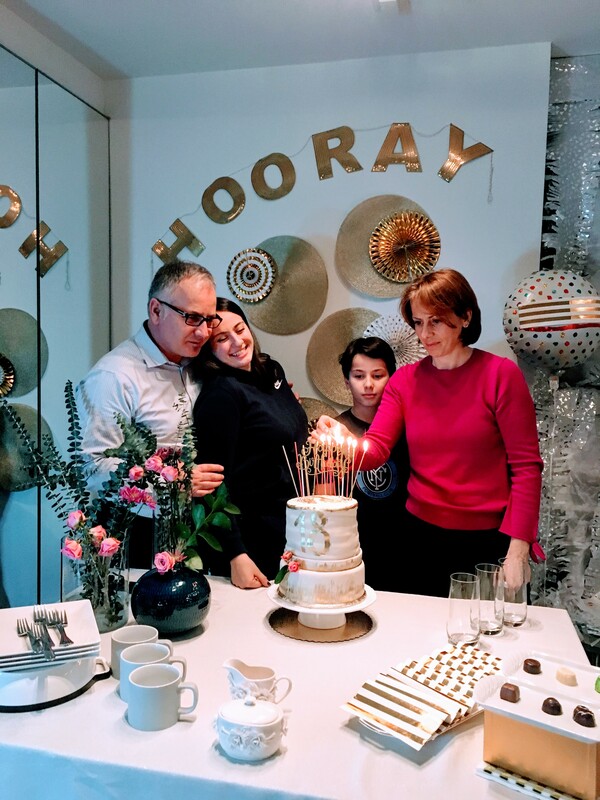 It was such a beautifull day filled with plenty of family love and happines. The countdown to NYE is on, and my table is already set. 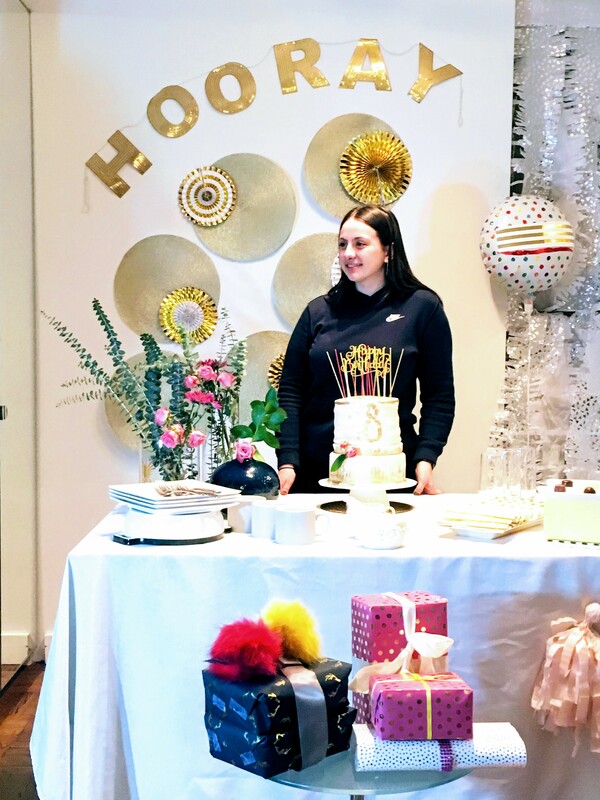 Usually my table is not set up early on a day, but I liked so much the table decor which I designed for the National Television RTK, the Morning Show so I had to use it for my dinner party tonight. 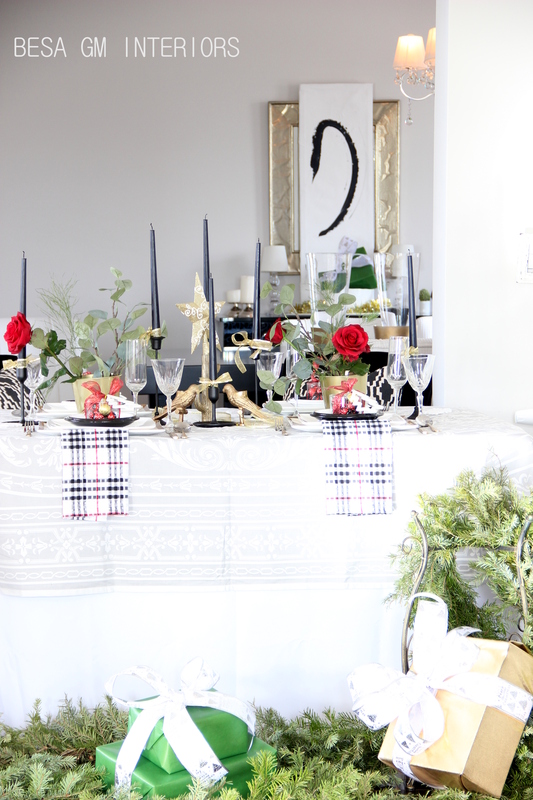 I was invited to set a festive table for the RTK Morning Show and share some table decorating tips with the viewers. 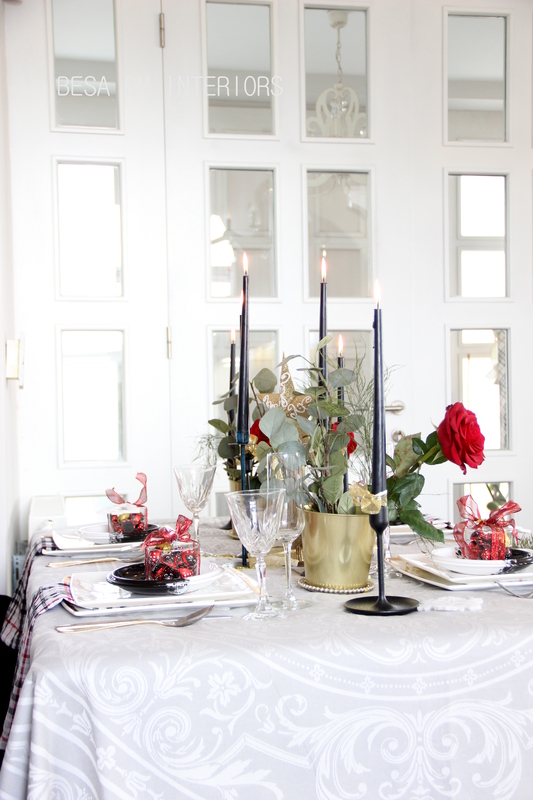 The table decor came out really nice and elegant, so I decided to use the plates, cutlery and all decorative elements for my New Year’s Eve dinner party. 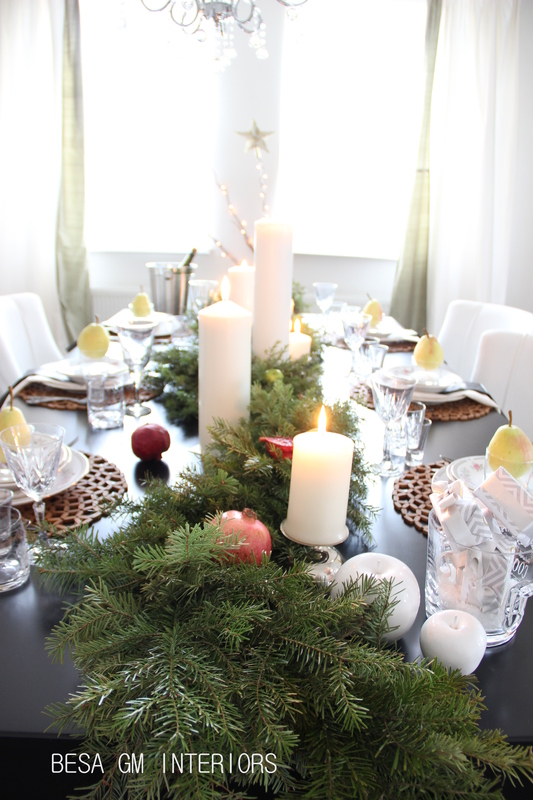 I am happy to share some of the photos of this festive table! Enjoy, and Happy New Year 2018! May this New Year be filled with happiness, prosperity and plenty of health! Thank you for visiting and following this blog! 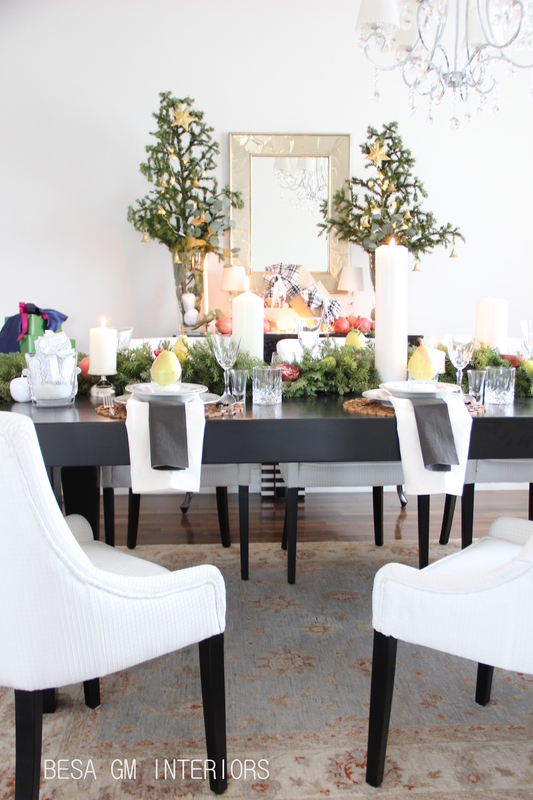 The dinner table has always been a place to gather with family and friends for good food and good conversation. 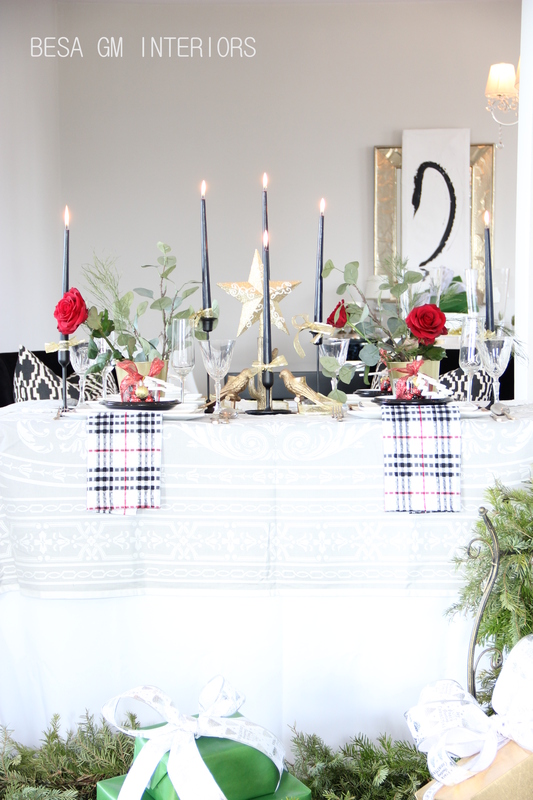 So many memories are made at the table, and especially during the magical Holiday Season. 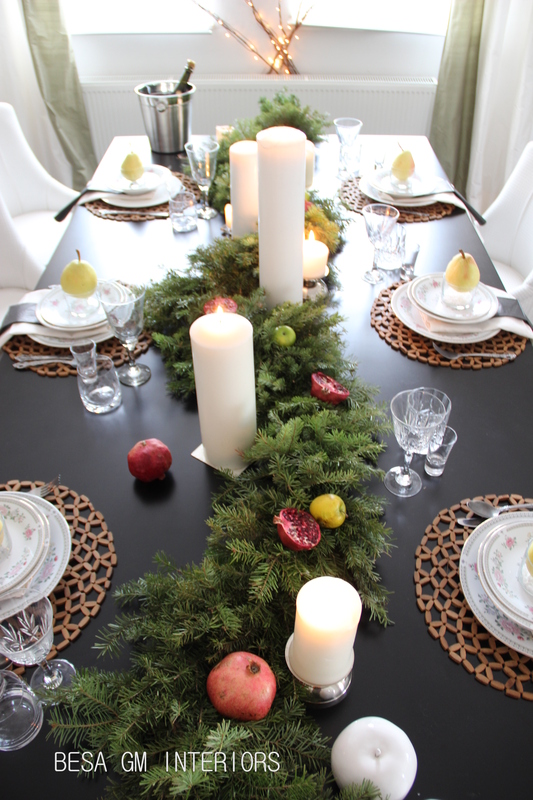 I love to entertain — and enjoy making the table look inviting. I find that part to be the most fun, and always keep myself showering with the questions like: What will I use for the centerpiece? Will I have a color theme? Candles or flowers? Round or Square plates? And the list goes on! This year I felt that I should have a Rustic Holiday Decor. I wanted to bring the outside in with natural greenery using elements from nature that are growing wild outside our door. 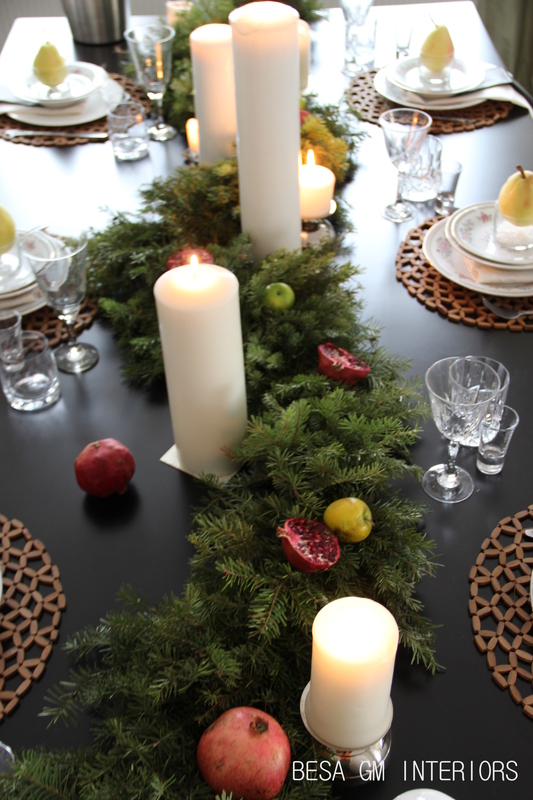 The centerpiece for a rustic tablescape doesn’t need to be anything fancy or elaborate, therefore, I DIY-ed this long garland from fresh pine branches where I arranged cut pomegranates and small green apples. 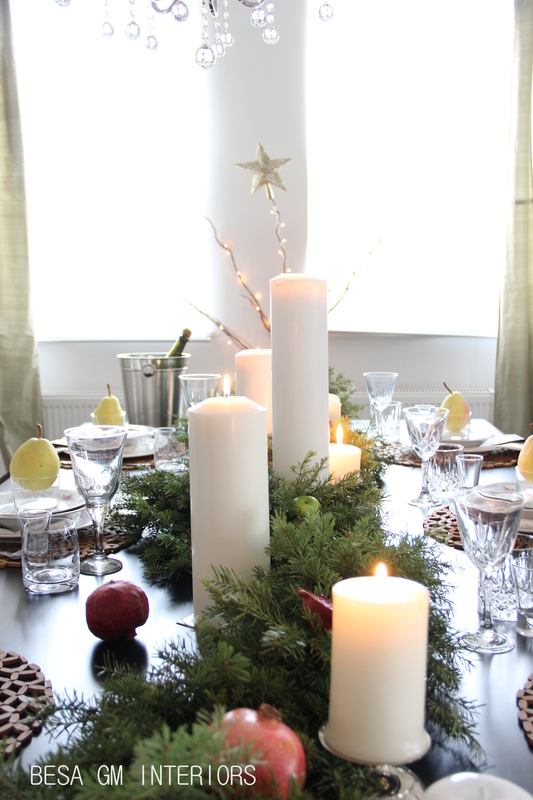 In between the garland branches I placed thick candles in variety of heights. 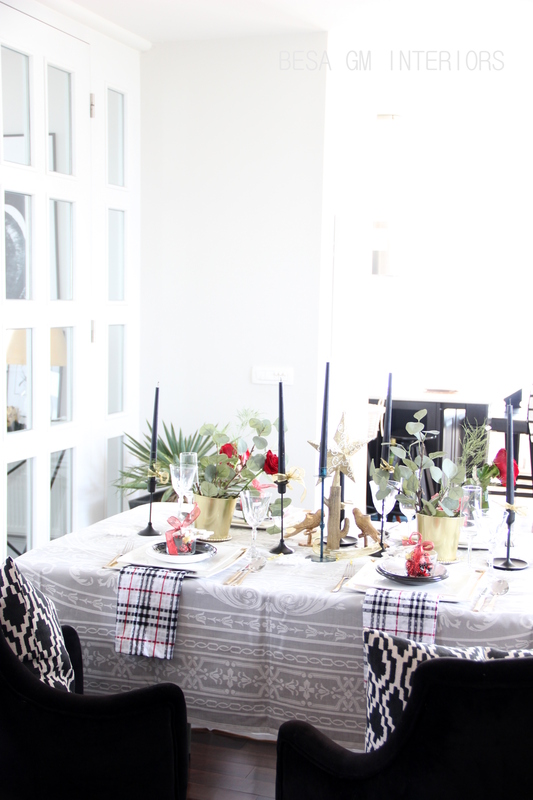 For the true rustic look I did not use a tablecloth, so everything is layered on a black surface of my dining table and even without any addition of the china, cutlery and glassware it looked so stunning. For the placemats I chose wood looking ones, and for that true rustic look I mixed and matched the glassware using different types of crystal from my collection. Mismatched crystal looks sophisticated yet not too serious. The cutlery was also vintage, a set that used to belong to my in laws, and was not in use for decades. The china is also a vintage set that I purchased 30 years ago, but which is super cute and I never wanted to get rid of, and I am glad I didn’t! 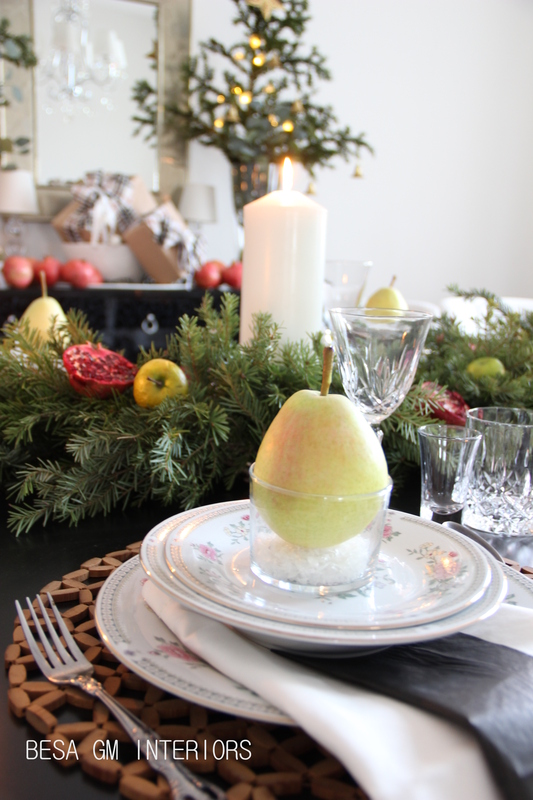 On top of the plate settings I placed a pear, an organic gift for each guest. 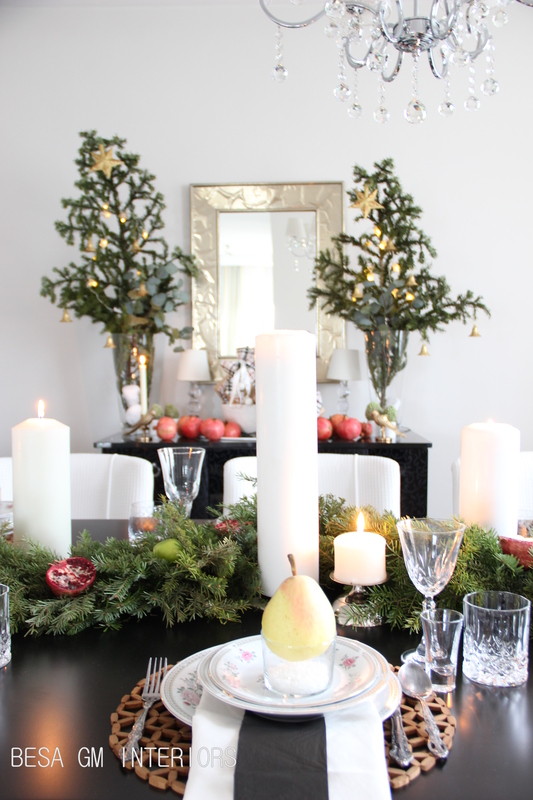 The pears added a whimsical touch to my rustic decor and it looks stunning! Everything on this table is so simple, mixed and matched, and the effect of combining all these things together worked perfectly. 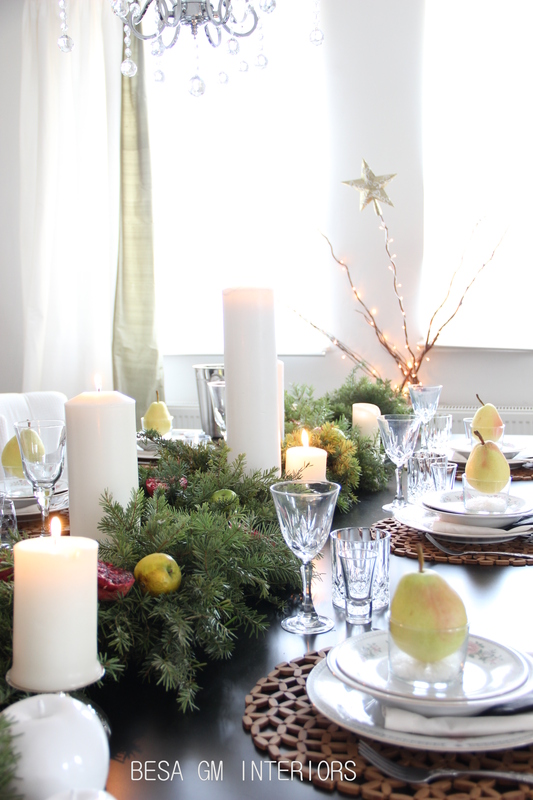 The table setting looks so earthy, organic, fruity and inviting. I am loving it! So my friends, the Holiday Season becomes truly magical thanks to our desire to make it look as such. 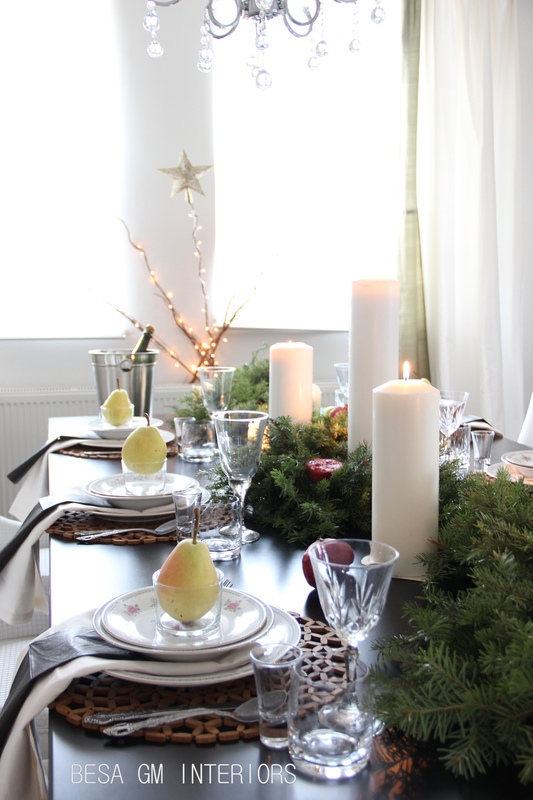 Anyone of you out there, with a bit of effort and a lot of passion can turn any simple table into a magical setting. May you have a Magical Holidays!